Everyone loves ice-cream right? Well, even for those who don’t get excited over ice-cream, I firmly believe that Italian style gelato will persuade you! 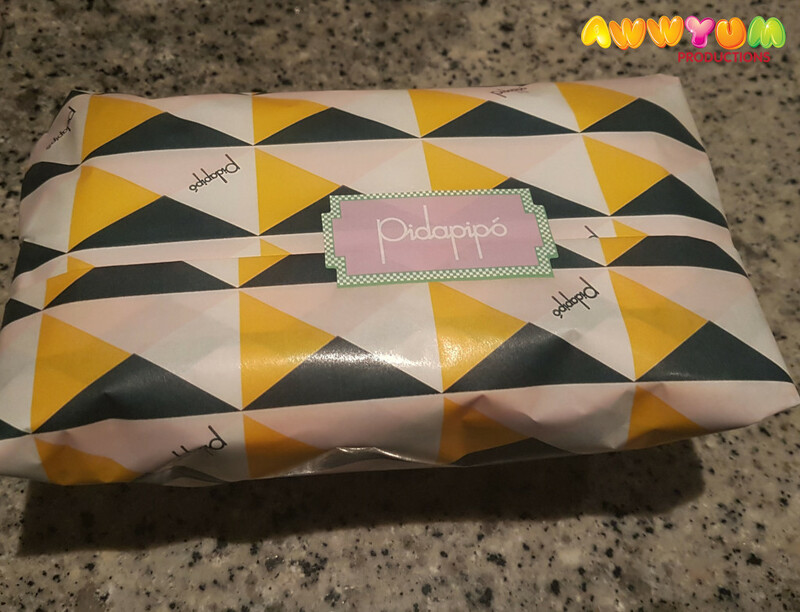 A fantastic store who is producing some great gelato is Pidapipo. There are two stores in Melbourne – one in Carlton and one in Windsor. 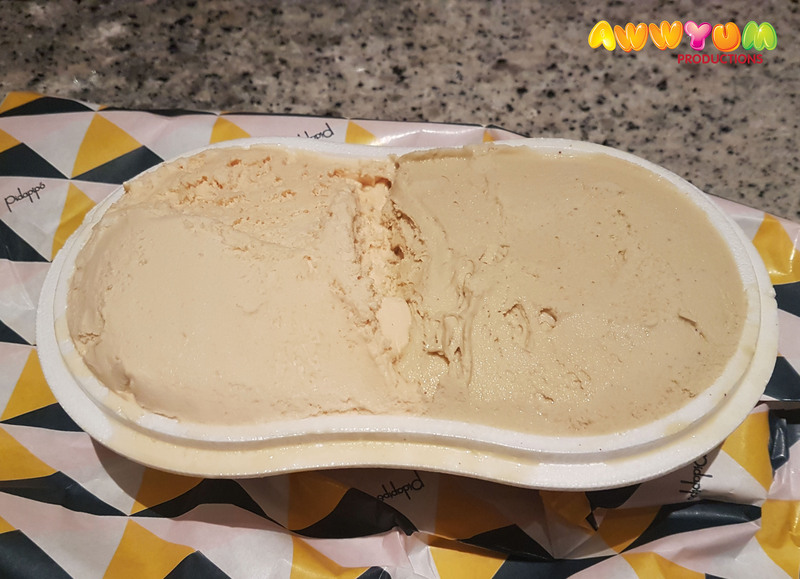 This review is my experience of visiting the Windsor store for the first time to buy some take-away gelato for home. Although there is a neon (pink) sign which makes it stand out, simply look for the crowd of people that stretches onto the street, as well as people taking photos of the place (like I was doing!). 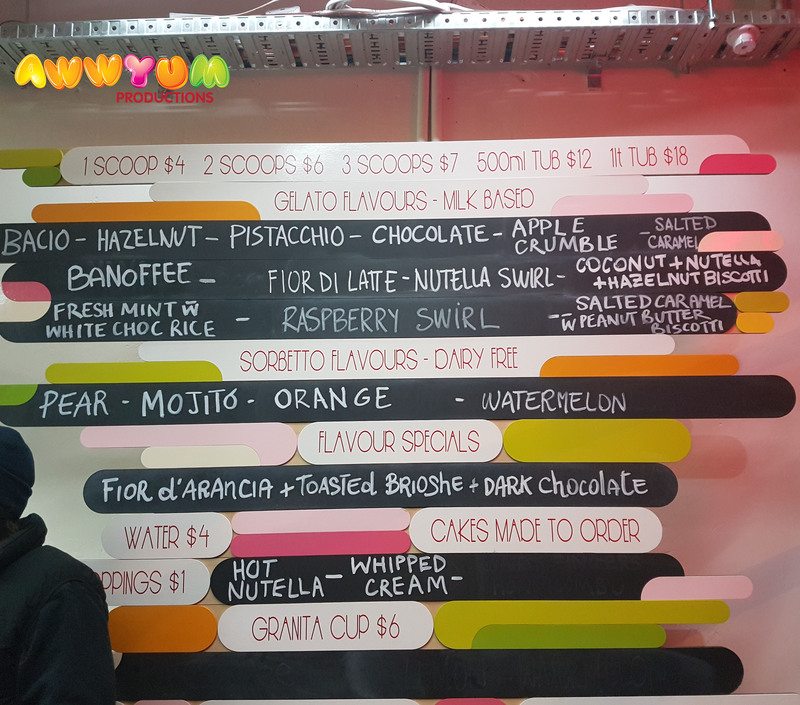 Inside the store, the menu dominates the right hand wall and features some traditional flavours such as Baci (choc/hazelnut) and pistachio, as well some more original flavours involving salted caramel, peanut butter and crumbled cookies. 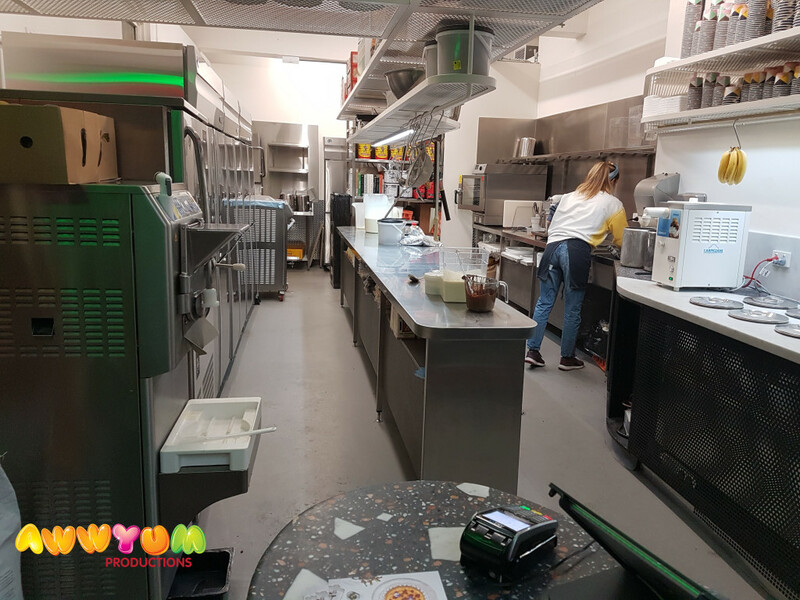 The preparation area looks very well maintained and organised – just behind the counter, where traditional looking vats of gelato are waiting to be served and scooped. Although I am personally not a fan, I think that many people would be excited at the prospect of a Nutella fountain. Well for those people, all their dreams come true at Pidapipo. 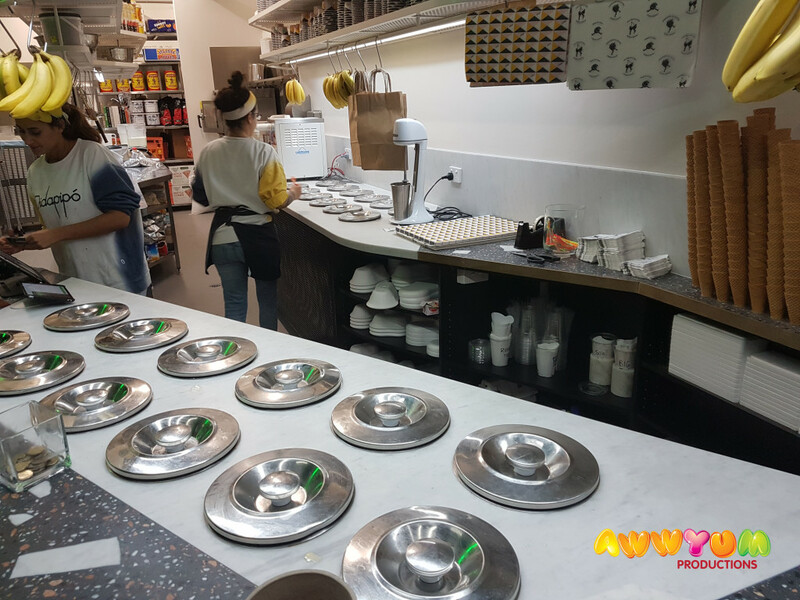 They offer a nutella swirl on all icecreams, which simply involves dipping the cone or cup under the fountain to top your gelato with hot Nutella! As mentioned, on my first visit I got take-away, so unfortunately I do not have a glamorous ice-cream shot to share. However, it is worth noticing the package. They do a good job to wrap the packaging sealed tight (to stop spillage and to keep the gelato cold). Opening the package was a treat! And the taste was amazing! We ordered salted caramel and pistachio. The pistachio was smooth in texture and tasted creamy, with a good dose of the pistachio flavour (and finely crushed nuts). The salted caramel was also good with a strong caramel flavour which is also a little bitter – that being said the gelato itself was a similar smooth and creamy texture as the pistachio. Awwyum Productions would love to engage with you! 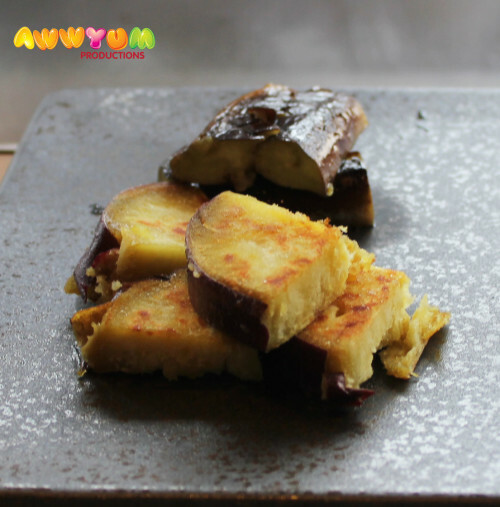 If you enjoyed reading our review, then please subscribe to us on Zomato, Instagram, Facebook, Twitter and YouTube to receive our latest reviews, photos and videos. It is not everyday that you get to say that you tried 2 Michelin starred yumcha (unless you live in HK!). 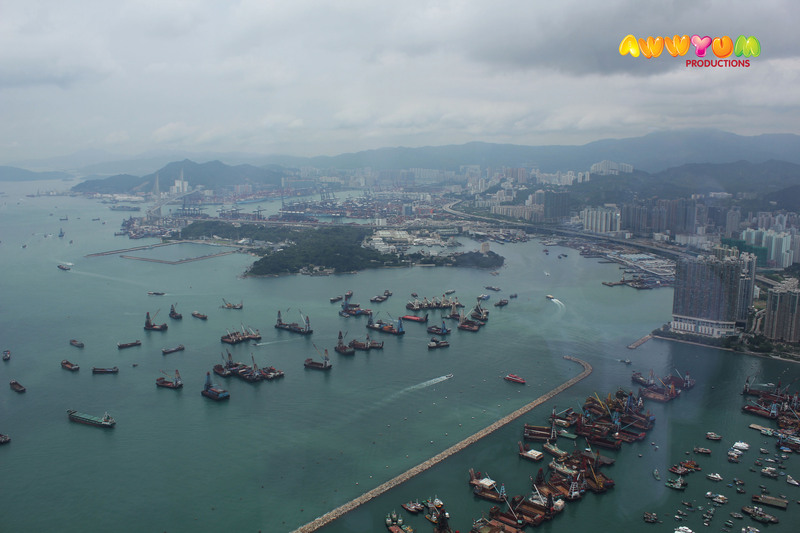 However, I had chance to experience this during my recent trip to Hong Kong. 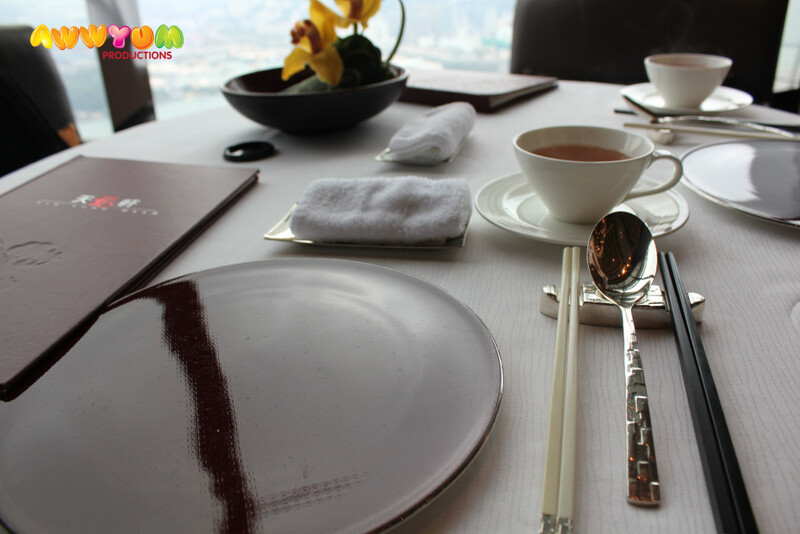 Most of the trip consisted of street food and local delicacies – but I made a point of booking at least one highly rated restaurant during the trip. After doing some research, I decided on Tin Lung Heen. It is one of only a handful of 2* Michelin Restaurants in Hong Kong, and one of the only 2* Michelin Restaurants for Chinese food in the world. 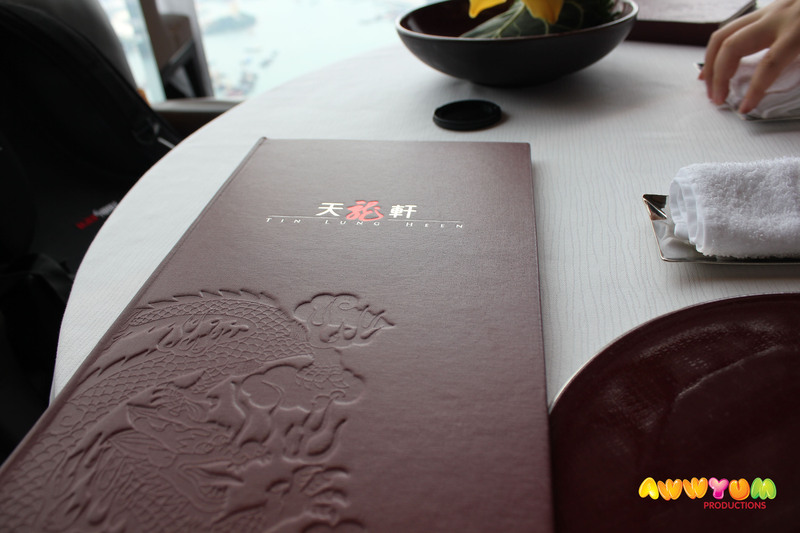 Tin Lung Heen (天龍軒) is located on the 102nd Floor of the ICC in Kowloon within the Ritz Carlton Hotel complex. It is accessed through the Ritz Carlton foyer of the ICC. The restaurant itself is very well laid out and has a very high ceiling and classy interiors. As soon as you walk in, the interior catches the eye without being too distracting. I am seated with my dining partner and we start by ordering tea, followed by a selection of yum cha items. I had requested a window seat in advance and was lucky to secure this (and I would also recommend that you do the same!). The view from our table was amazing and overlooked Kowloon harbour to the West (with Lantau Island in the distance). Our table itself was also well presented with two sets of chopsticks per person (apparently one for communal serving, and one for individual consumption! ), wet towels and an orchid. Our tea arrived along with some candied walnuts as a light appetizer. From there, the food started to roll in. Technically we had a yum cha meal, however we did order a couple more substantial menu items to round out our meal. 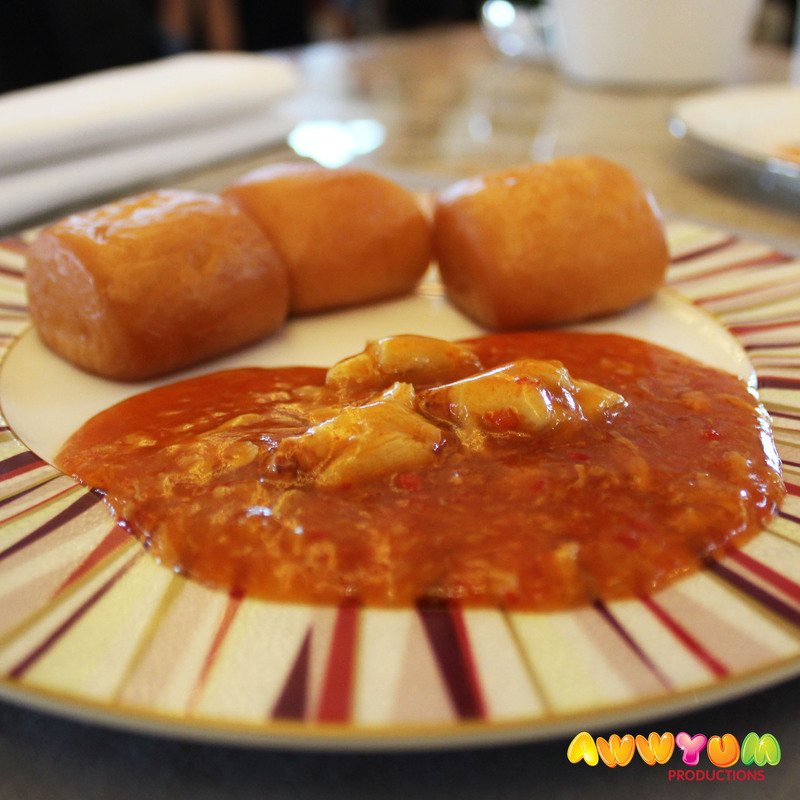 Firstly, the siu mai with golden leaf arrived – which was very tasty and paired well with their chilli sauce. Next was the turnip cake with a prawn and chilli dressing. 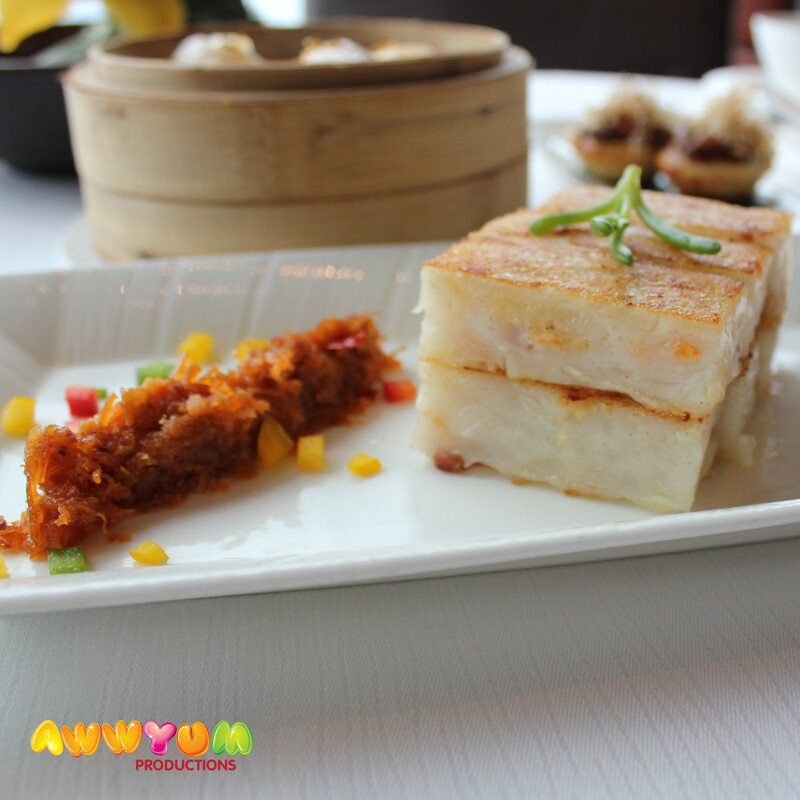 This was better than most turnip cakes that I have tried – the layers held together well and it had great flavour. 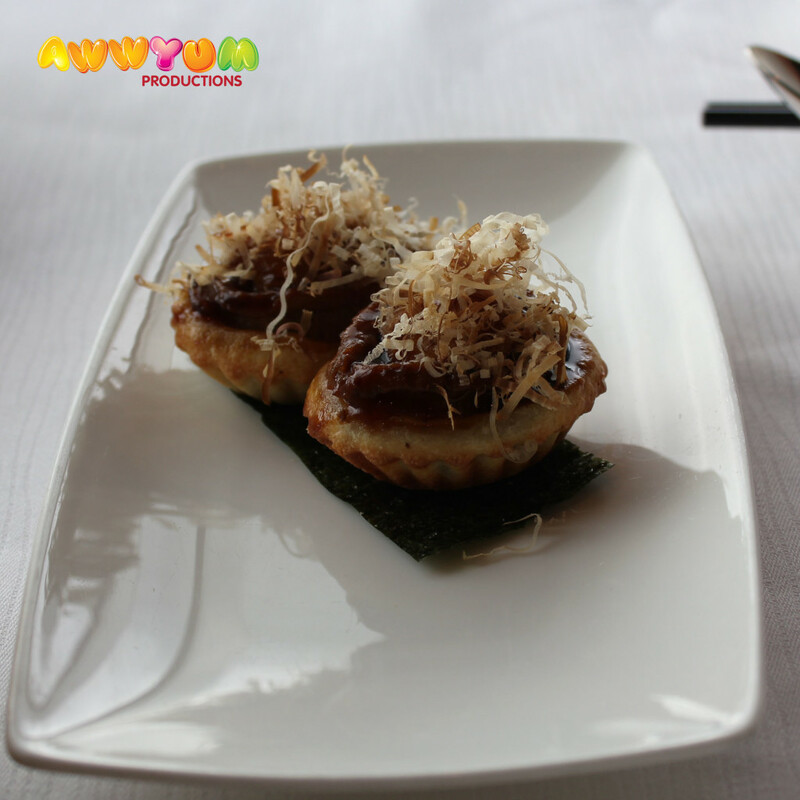 Another yum cha item was baked abalone puffs with duck meat. I don’t often have a chance to try abalone. 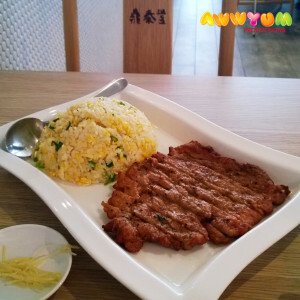 It was cooked very well – soft, with a good seasoning/sauce. 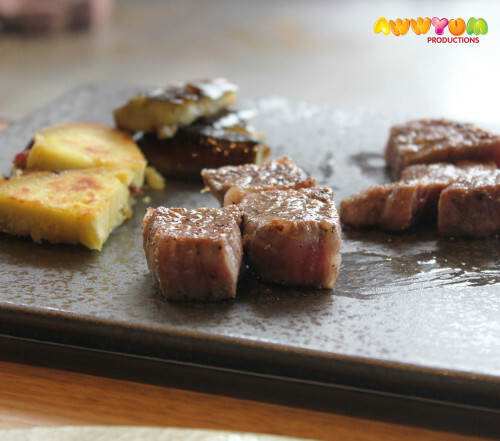 We also ordered a half serve of their Iberico char siu pork (handy tip: we were advised to pre-order this at the time of our booking. 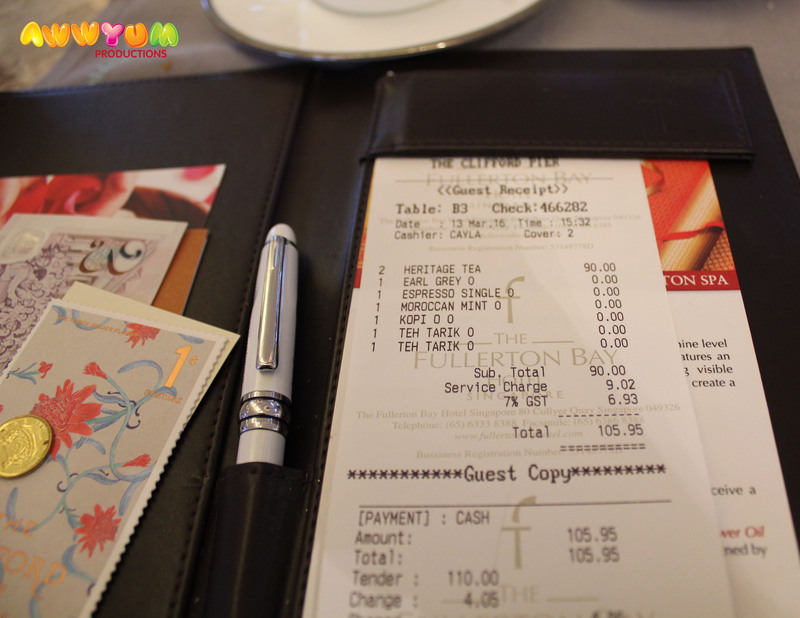 They also accommodated our request for a half serve – as a full serve would have knocked out a group of 2 people!). Given that it is supposed to be their house specialty I was expecting big things. I was definitely satisfied but personally prefer the more traditional ‘roast meat shop’ style of char siu. 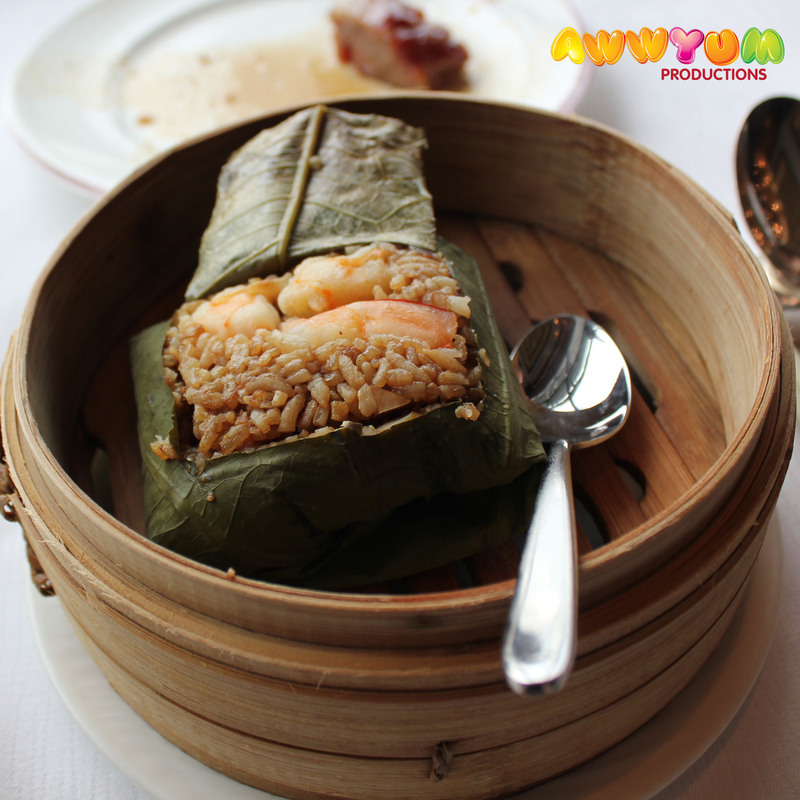 Our savoury courses were rounded off with fried rice with shrimps and seafood. It was a very good fried rice, with fresh seafood that tasted great. 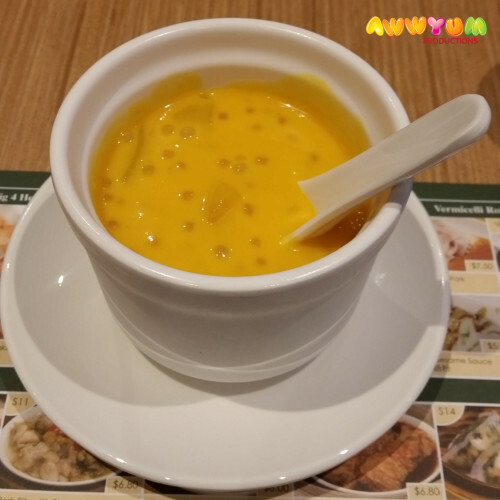 We left room for dessert and I opted for the chilled mango cream with pomelo and sago. A classic yum cha dessert and this really hit the spot! Finally, we were brought some complementary petit fours as a final dish. 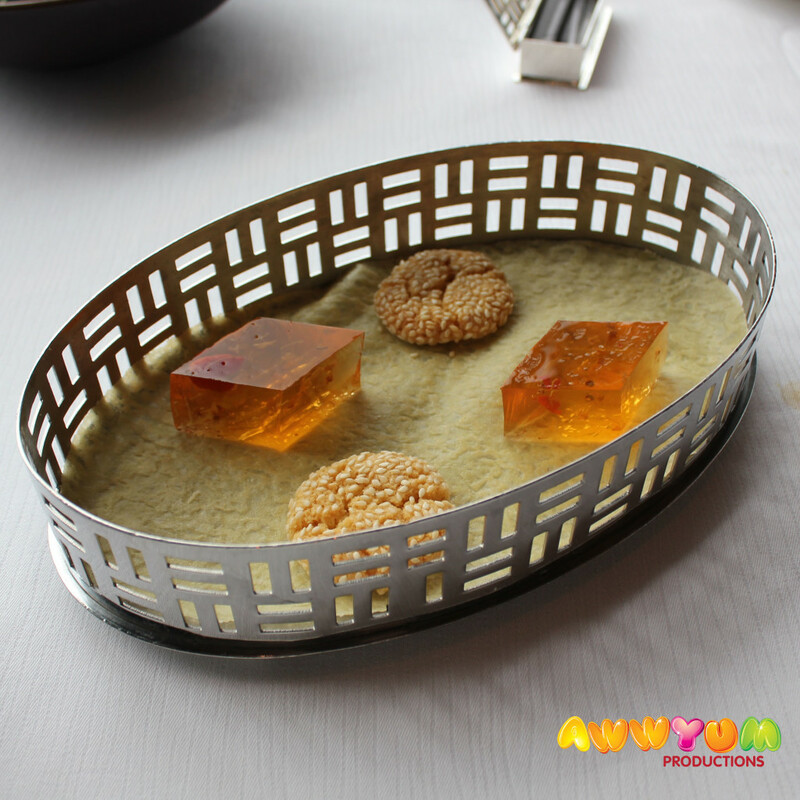 These included ozmanthus jelly and a sesame/walnut cookie. A nice way to finish the meal. The service was first rate from start to finish. We were seated without any fuss. Our waiters were attentive and also helpful with the menu. The ‘tea service’ was fantastic – and I literally never saw the bottom of my tea cup! In terms of price, it was not a cheap affair! In total around $90 AUD per person. 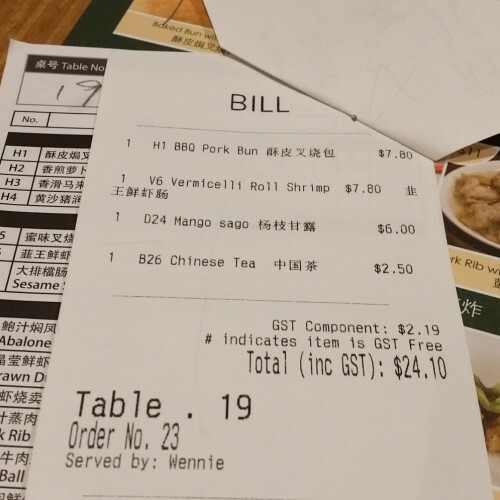 The bill is below which has a break down of all the items ordered. Even though the price was a little dear, it is not skyrocketing into the 100s of dollars, and these days one can easily spend $40AUD per person on yumcha in Australia. I would call it good value considering the food was all top quality, the view and interior was great, and the service was memorable! I must admit that I don’t often go to have high tea when I am based in at home in Melbourne, Australia. 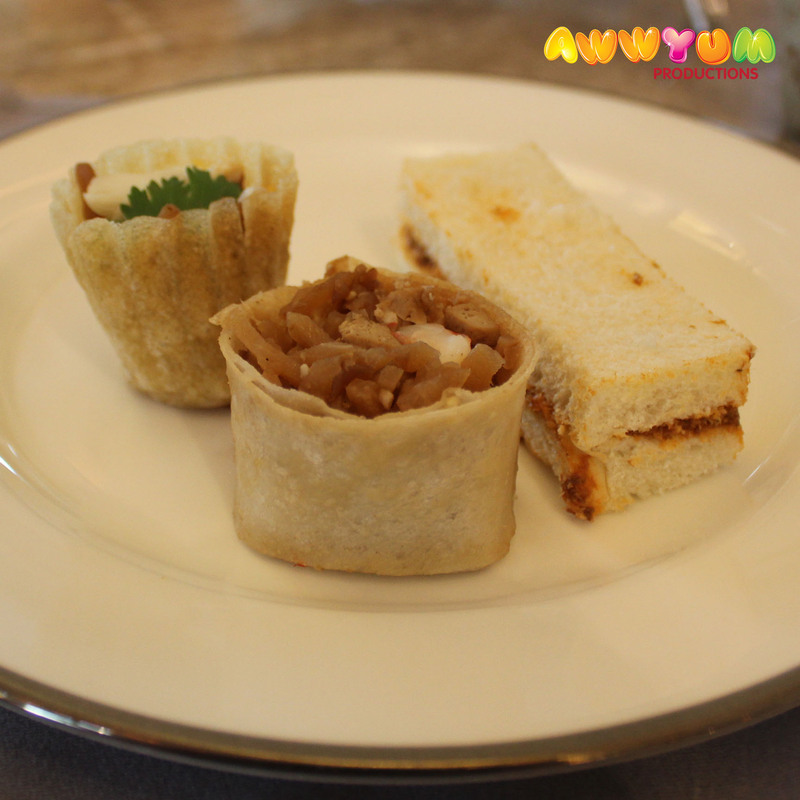 We seem to have such a diverse food culture (not to mention the usual comfort foods) that high tea is not high on the list. 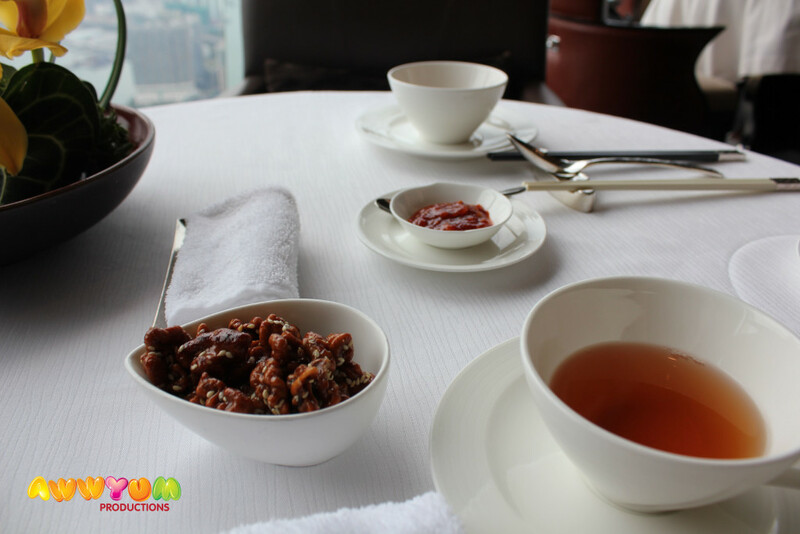 However, during my recent holiday to Singapore, I was recommended to visit The Clifford Pier (at the Fullerton Bay Hotel) for a weekend high tea – known as the Heritage Tea. 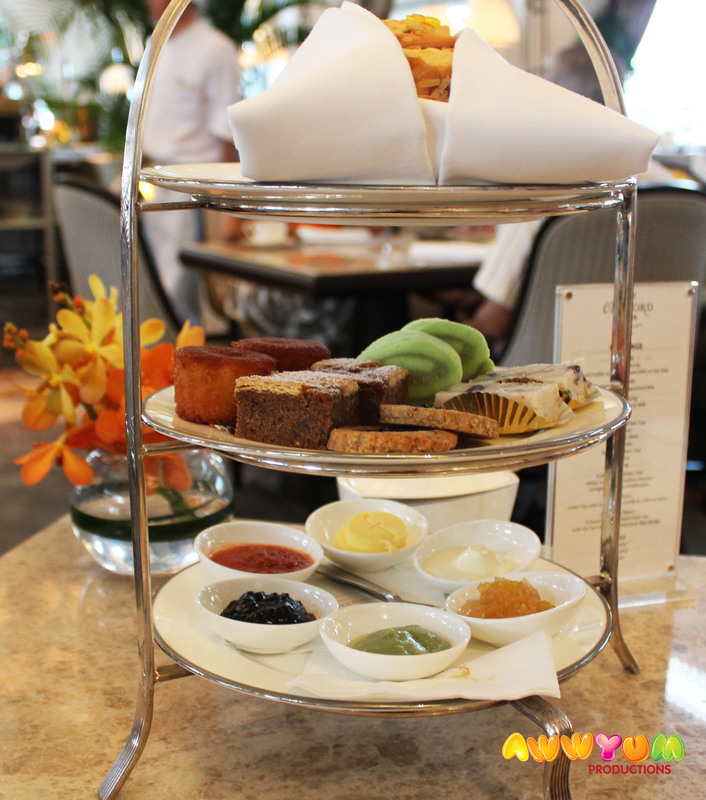 The thing that particularly caught my eye with this high tea was that it has a local Singaporean twist. 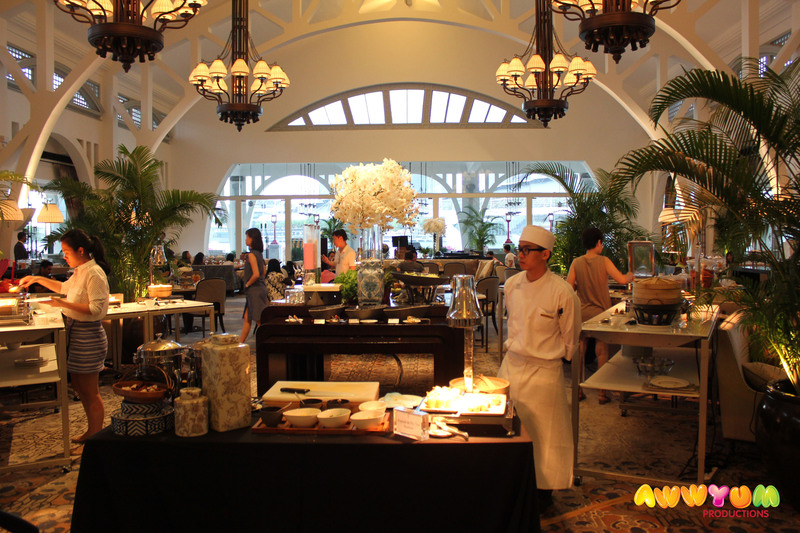 The majority of the food (and beverage) items available are an adaptation of Singaporean classics. So basically, I am able to get a classy fulfilling meal, act like a tourist and get to sample some local culture – win win win! 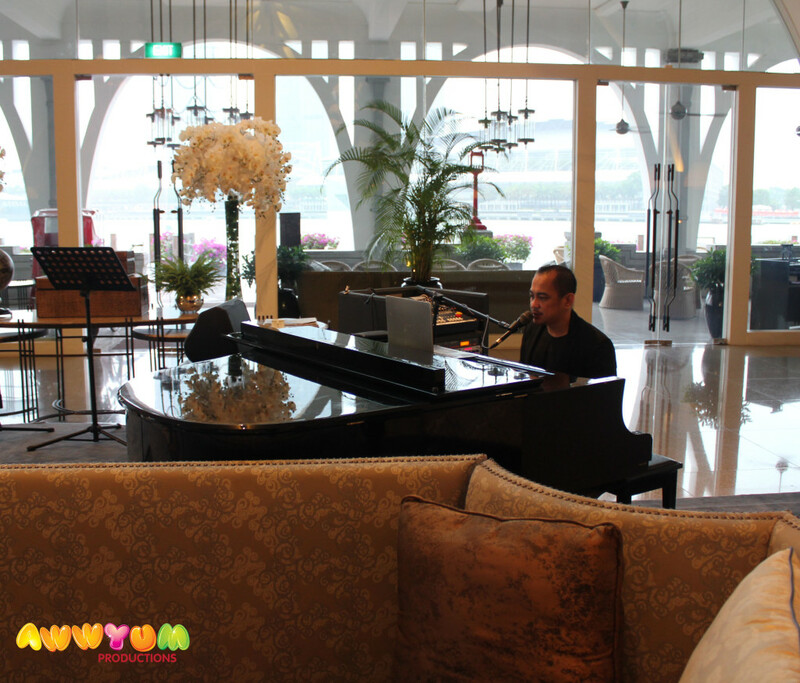 The Fullerton Bay Hotel is in a prime position right on Singapore’s harbour. It is opposite the new Marina Sands casino and hotel, and actually provides a unique view of that complex. 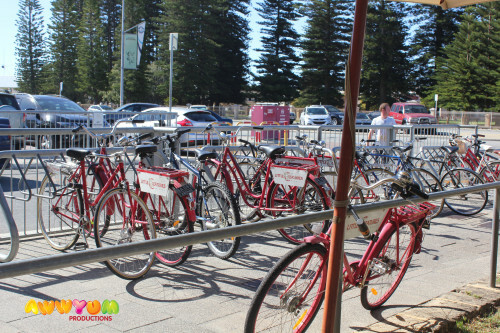 As the name suggests, The Clifford Pier is actually a pier! That is, it stretches out over the water. 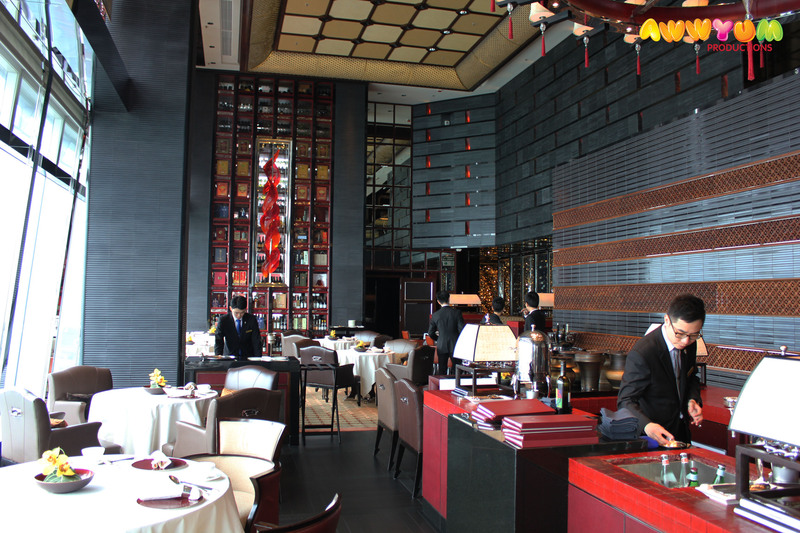 However, you will not be exposed to the elements – the entire dining area is indoors (undercover and aircon!). The interior is spacious and stunning! As we checked in for the high tea, we gazed around in awe as we were led to our table. The Heritage Tea set used to come on a traditional three tiered stand (which overflowed onto a couple of additional plates). 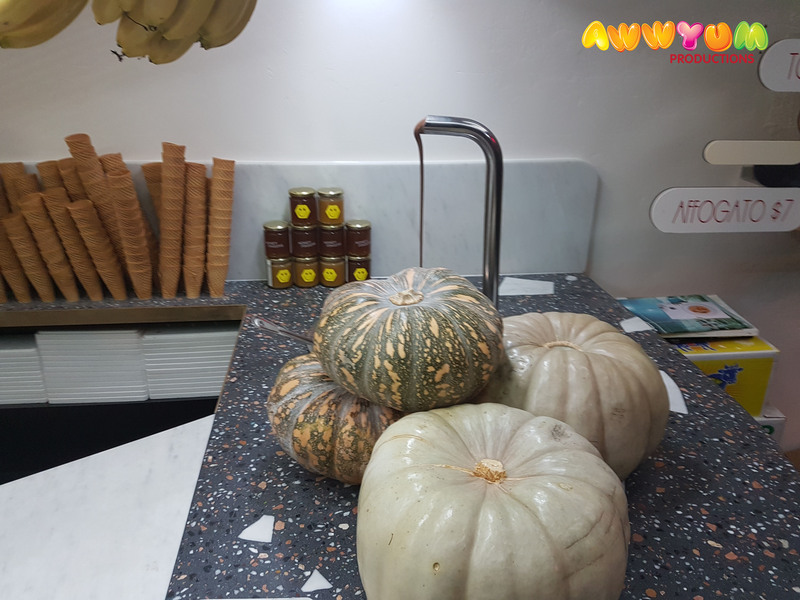 However, more recently, the weekend version now has a buffet element for the savoury items, and the sweet items come out on the stand. In particular, this was my only opportunity to try chilli crab, and it was delicious, with flavourful crab meat swimming in a sweet tangy tomato sauce. 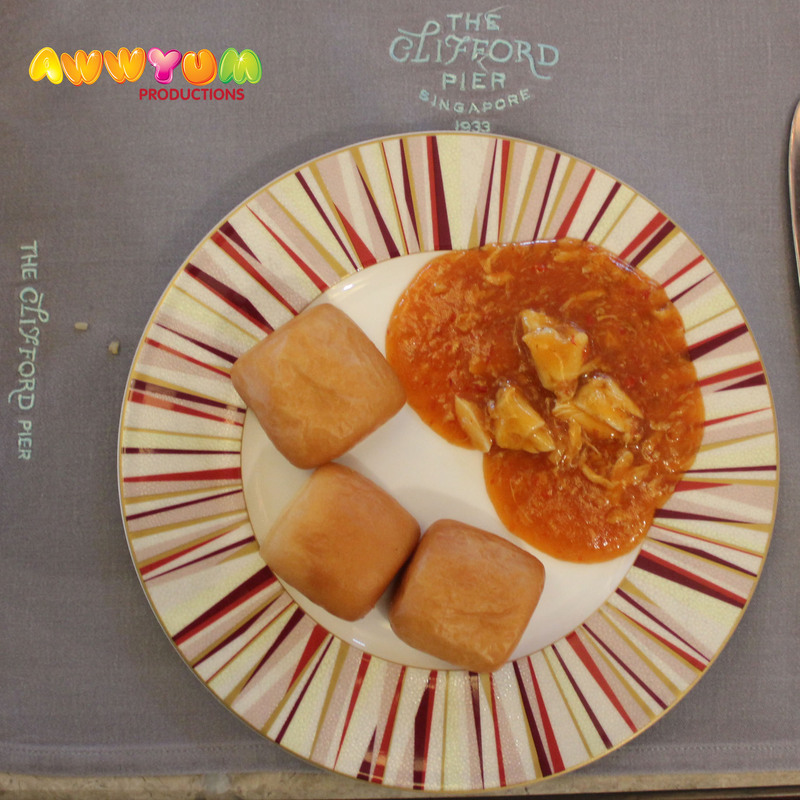 The small buns (‘man tou’) that accompanied the dish were also very good – crisp on the outside, with a fluffy centre. The three-tiered stand was brought to our table and featured a number of yummy desserts, including scones with jam, pandan roll, butter cake, biscuits and a fruit/nut type bar. 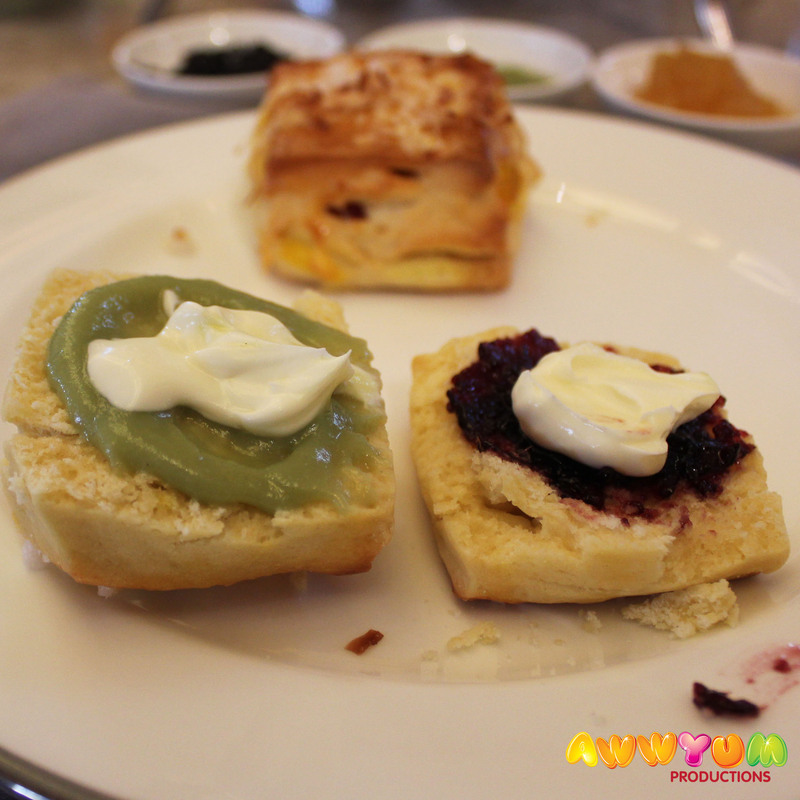 These desserts were accompanied by a range of condiments including roselle (similar to blackberry) jam, cream, kaya (coconut) jam and butter. The condiments were put to good use! 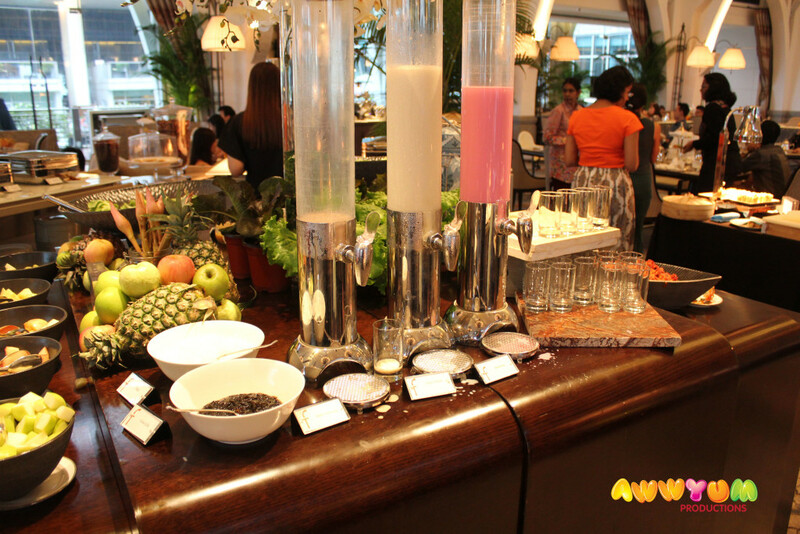 Of course, no high tea would be complete without great beverages. The Clifford Pier provides a range of beverages that are included as part of the high tea set. 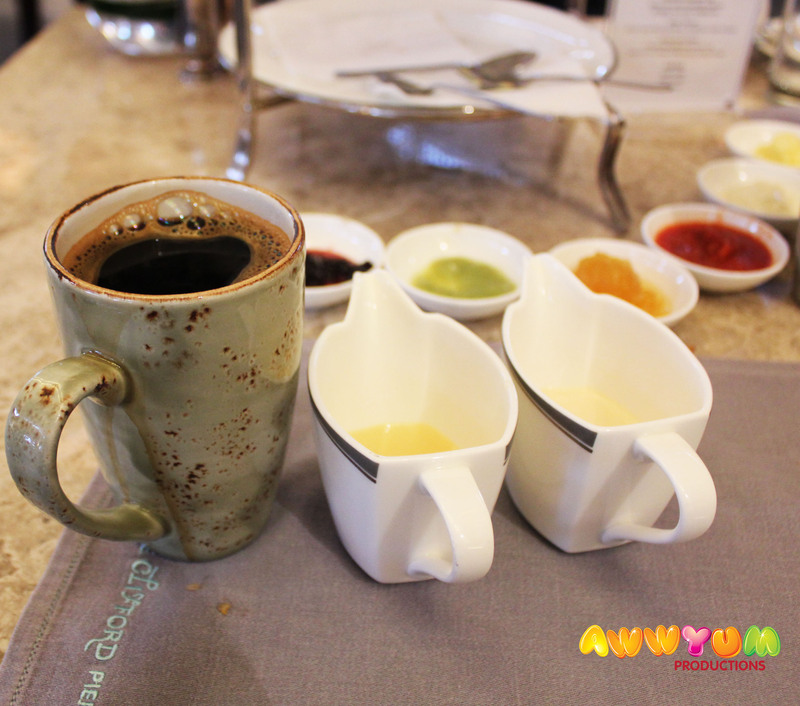 These include three ‘local’ beverages made to order: kopi o (black coffee with milk and condensed milk to mix), teh tarik (pulled milk tea) and air bundung (rose water milk). 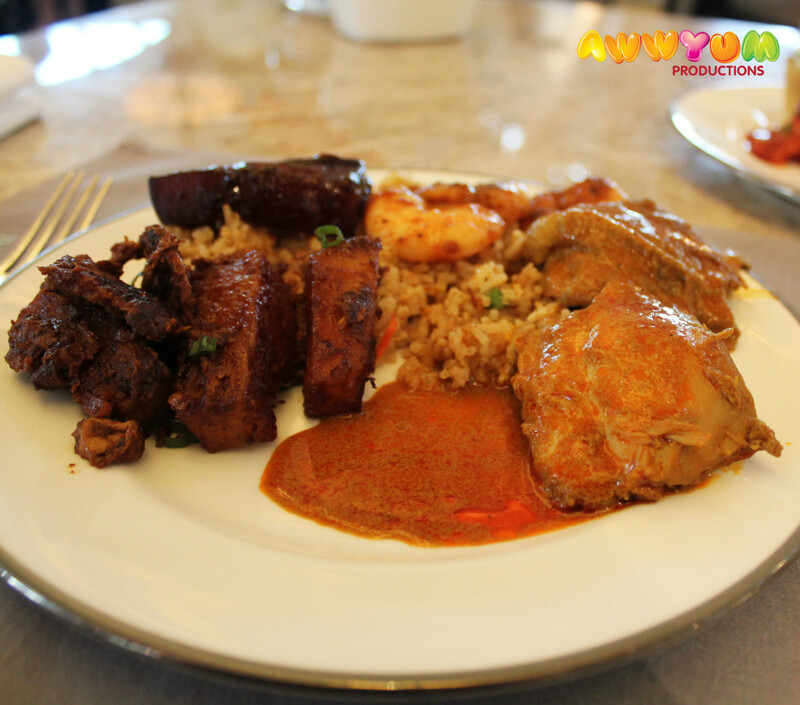 They also had other local favourites as part of the buffet, which included milo, plain milk and air bundung (pre-made). In addition to the local favourites, you could order a selection of teas and coffees. 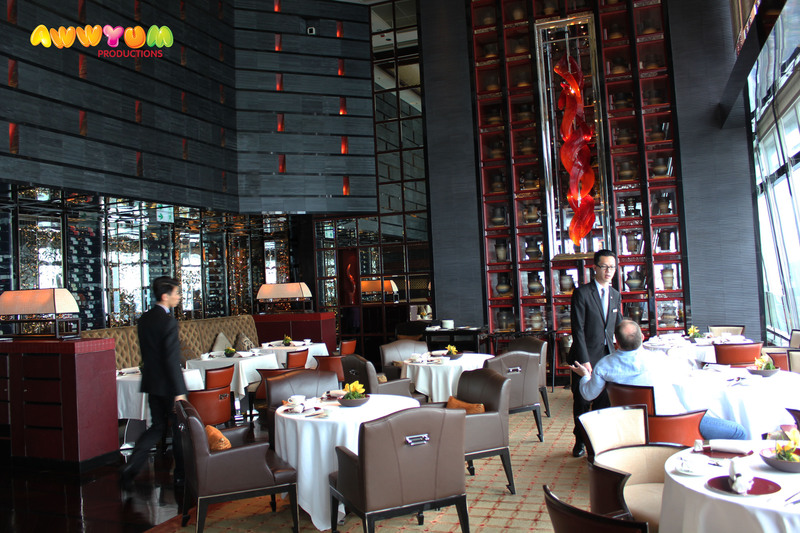 In particular, they offer a wide selection of TWG teas, which are certainly worth trying. TWG is a Singaporean brand which is marketed as being very exclusive and ‘top end’. 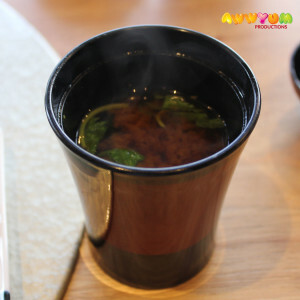 Throughout South East Asia they have salons and cafes featured in shopping malls and airports (where their teas can be sampled and purchased). The TWG teas that I tried were very good! 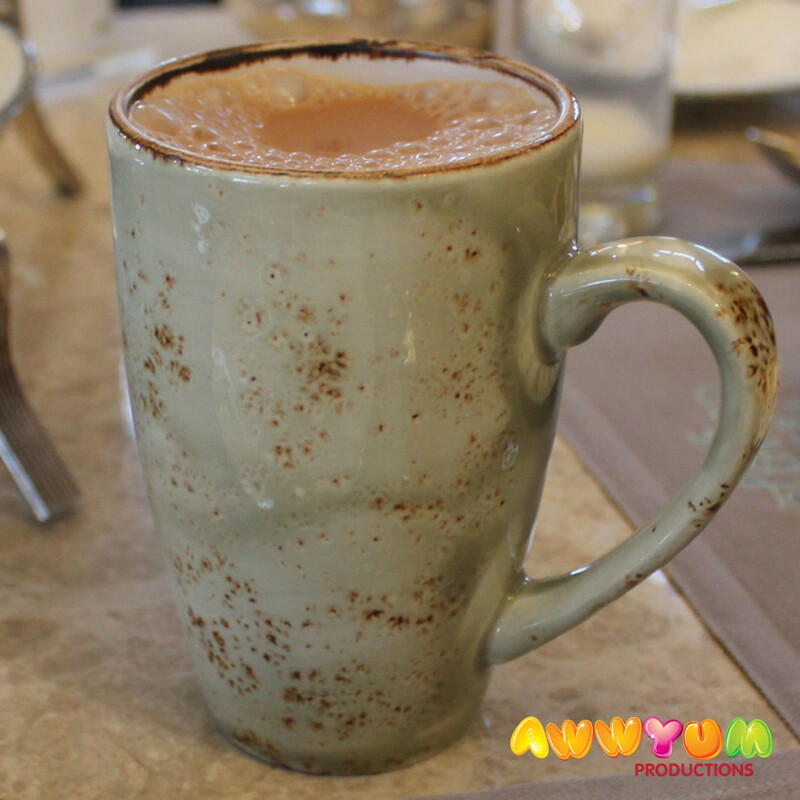 We took advantage of the variety of beverages on offer and I personally ordered a teh tarik, kopi o, espresso and earl grey tea. Yum! The general atmosphere of the place was good. The restaurant was actually full, but it did not feel crowded. There was also entertainment in the form of live music. The views outside were great. 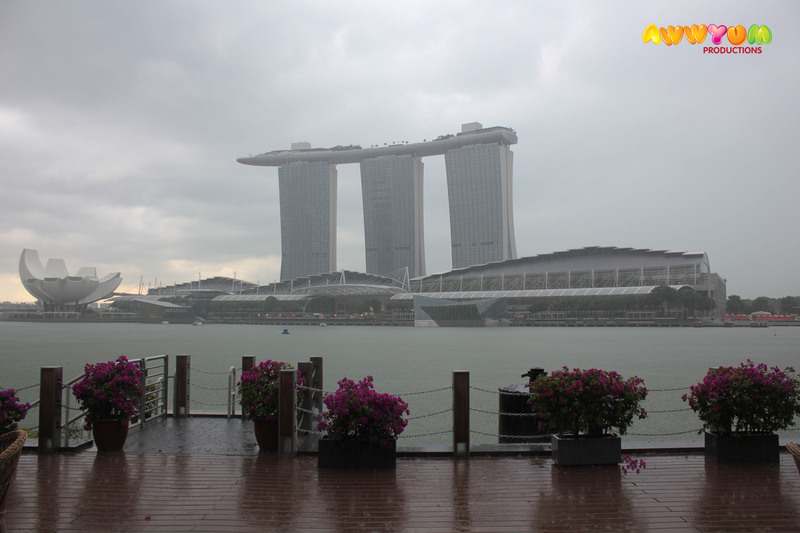 Even if you do not have a window table, simply stroll outside onto their private boardwalk to view the harbour and Marina Bay Sands complex. Perhaps the one let down was the service. As mentioned, it was a ‘full house’, however the wait time for drinks was quite long and I often needed to re-check our orders (literally a 30min wait on two occasions for drinks). However, besides this minor glitch, the service staff were generally helpful, efficient and attentive. In terms of pricing, I believe that it is great value at $45 SGD per person (plus taxes, which brings the total to about $53 SGD) for food and beverages. It is probably a little pricey by local standards ($4 chicken rice anyone?). However, for a top hotel, and a high tea in general, it is good value! 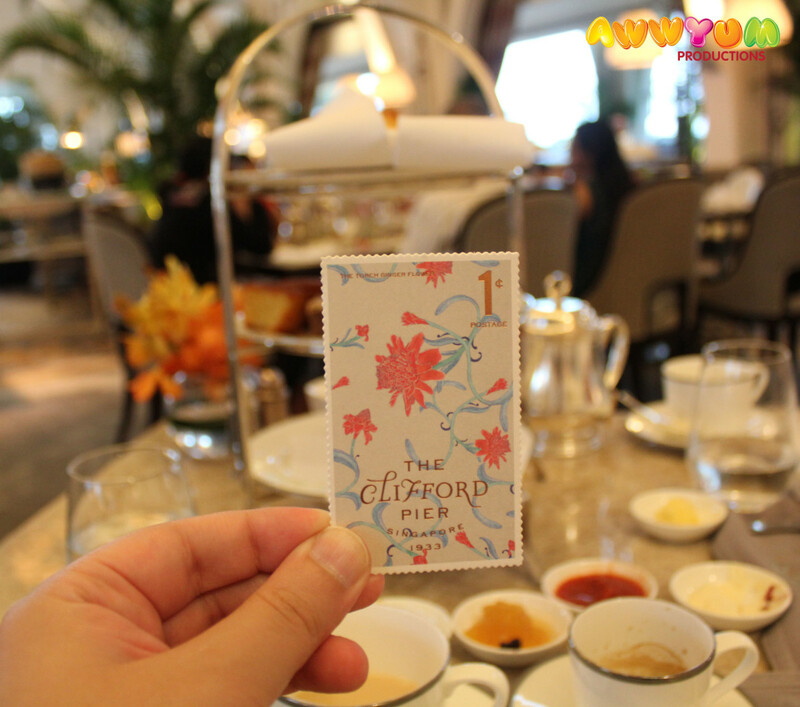 I would certainly recommend The Clifford Pier’s Heritage Tea for a special occasion or for visitors to Singapore looking to do something a bit more ‘upmarket’ with local twist! I had just arrived in Japan at Tokyo’s Narita Airport, and like many travelers my first destination was JR Tokyo Station (via the Airport Express Train). Tokyo Station itself is huge! Being from Melbourne, Australia, there is nothing local to really compare it with. The mix of above ground, subway, airport link and shinkansen trains all meet at this single station. The sheer size of the complex and volume of people was an eye-opener! One upside to the chaos of Tokyo Station is that it is well serviced by many shopping centres, department stalls and food outlets. I literally stepped off the airport train, met my friend and headed to the 12th Floor of Daimaru to eat at Tsunahachi. 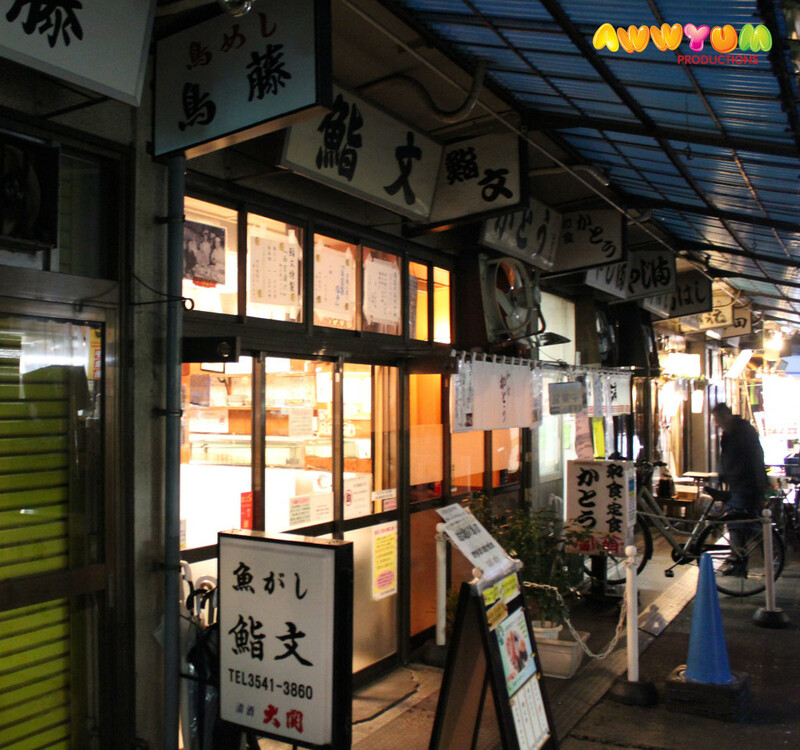 Tsunahachi is a tempura restaurant with a number of branches throughout Tokyo, as well as around the country (Sapporo and Kyoto). Don’t let this dissuade you. 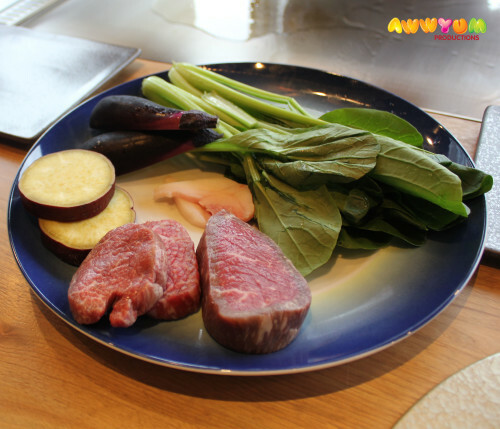 In Japan it is common for a restaurant to specialise in a single type of cuisine (if anything, it becomes their speciality). 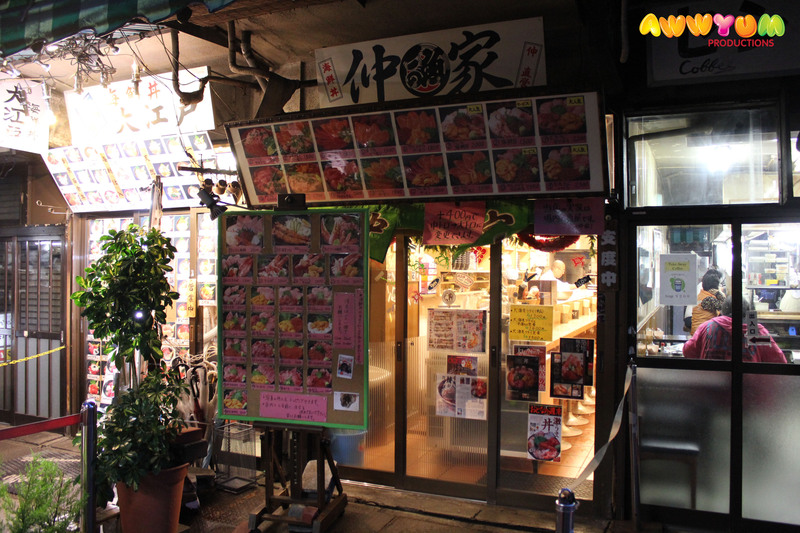 Secondly, chain restaurants in Japan appear to keep their quality and standards high, and can be among some of the most memorable places to eat (as compared with KFC and McDonalds, which are for convenience but arguably don’t serve high quality food). 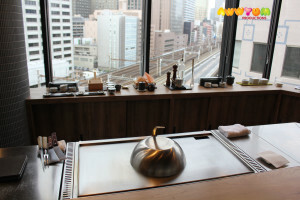 We were fortunate to be seated at a counter, so I could see the chefs hard at work behind their respective fryers. Despite being a counter, there was sufficient space for a variety condiments and side dishes. 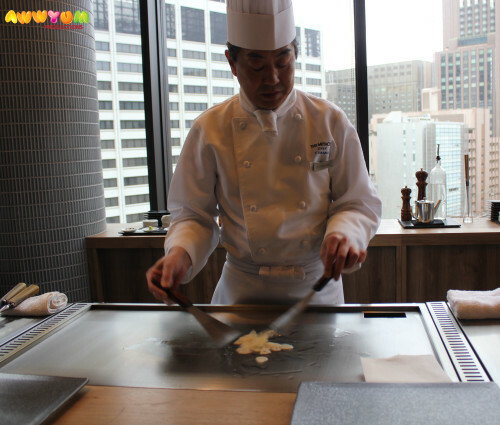 The chefs were not so interactive with the diners, but we literally had the best seat in the house to see them frying up all sorts of different meats and vegetables. The seafood that they used was particularly fresh. 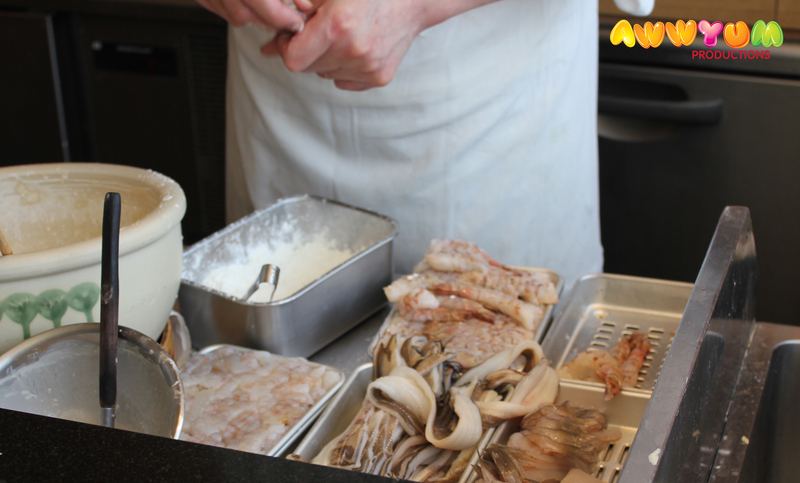 The prawns were actually live (in a tank behind the chefs) and were prepared periodically before frying. I took a peek over the counter and everything looked great. I was inspired by the seafood in front of me, so made a point of ordering a set lunch that featured the good looking seafood on offer. My friend ordered the same set menu. 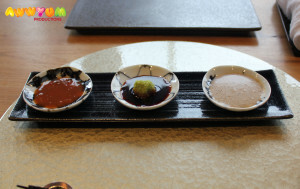 The first thing that we were brought were different types of salts, which are used as a condiment to top your tempura. 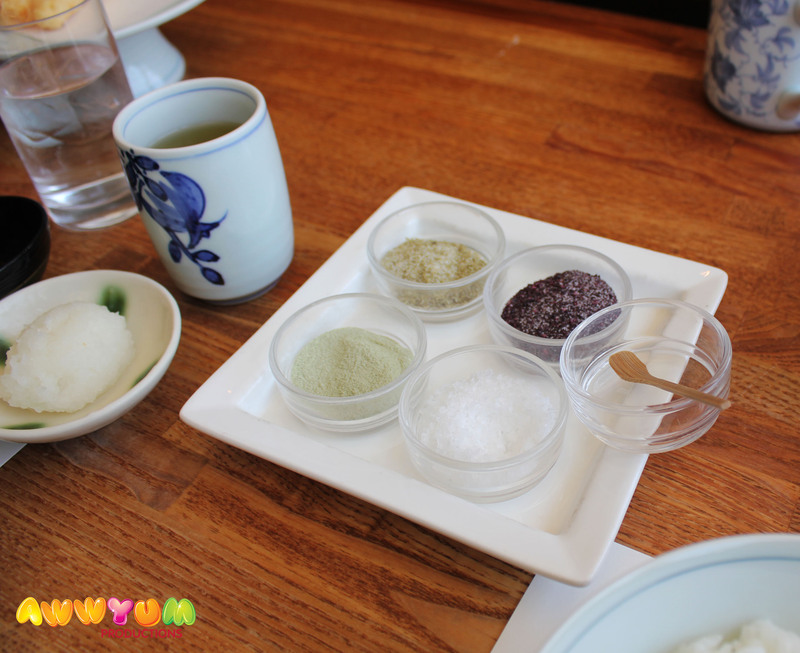 The salts included wasabi salt, sea salt, shiso salt and seaweed salt. Each had their own distinct flavour! 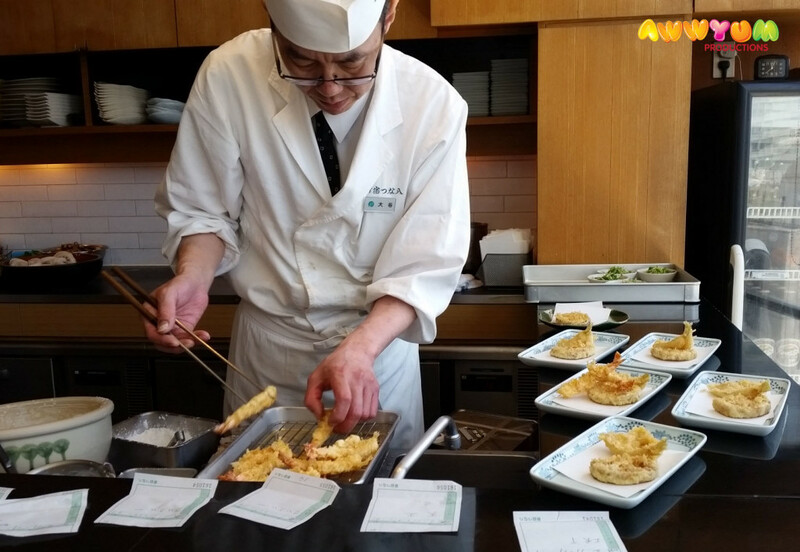 For tempura novices, there is a guide to eating tempura on the tables (or available from the waiters). 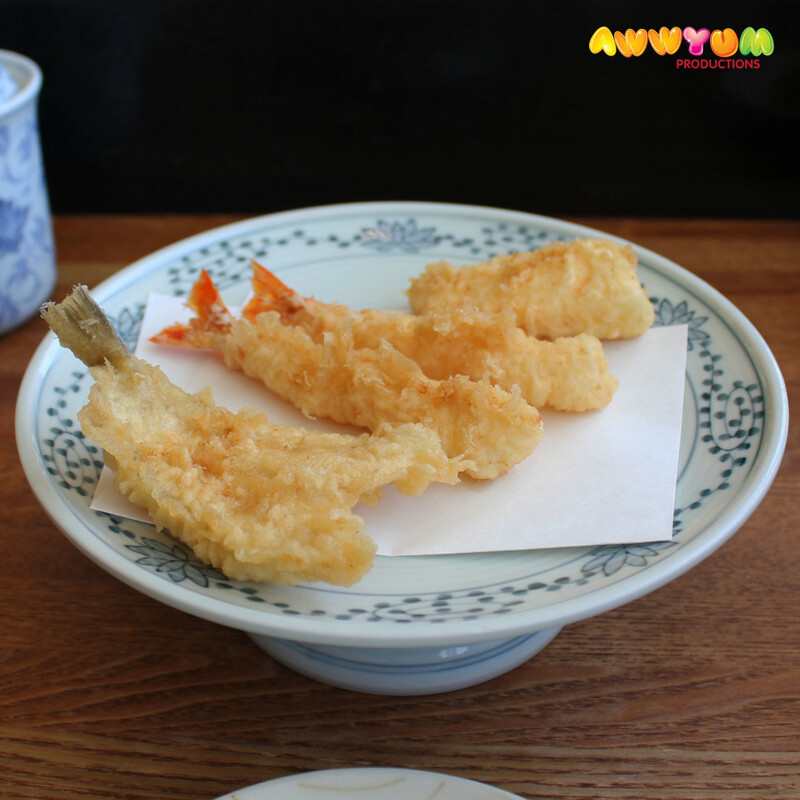 It is worth checking out if this is your first time eating tempura in Japan. 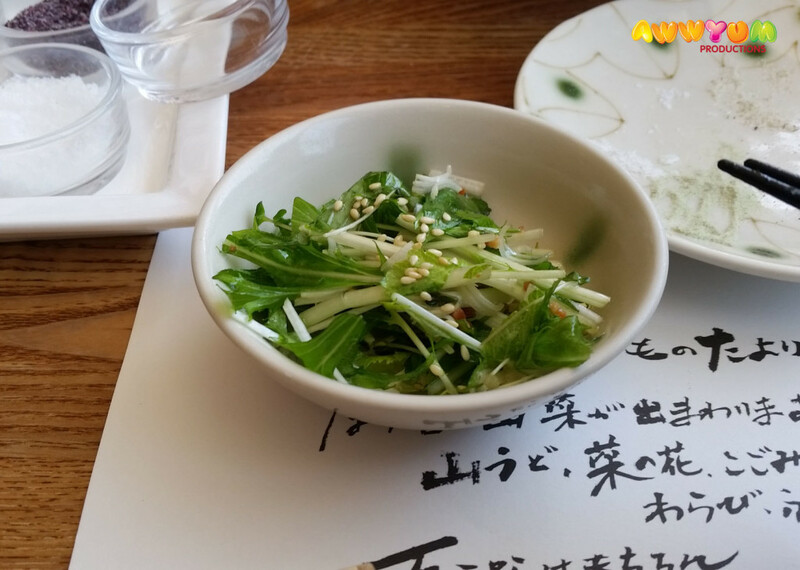 The courses began with a small salad appetizer, as well as a minced radish (which is used also as a dipping sauce). 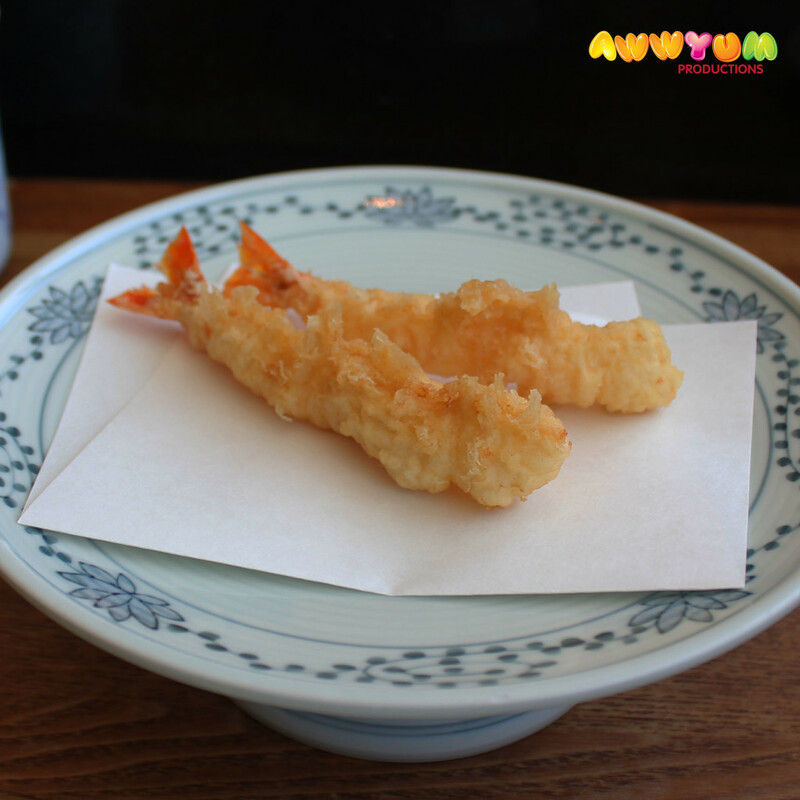 The tempura then started to flow! to start with, we had prawn tempura. The prawn was then accompanied by squid (top) and a small butterflied white fish, most likely a sand whiting. All three were excellent! The squid was particularly fresh and soft. The next course was this deep fried clam. I believe its called a ‘storm clam’. Its shell was filled with chopped clam, mushrooms and a few other ingredients, and then deep fried whole. This was the highlight for me. It looks a little ugly, but the taste was unique and full of flavour! 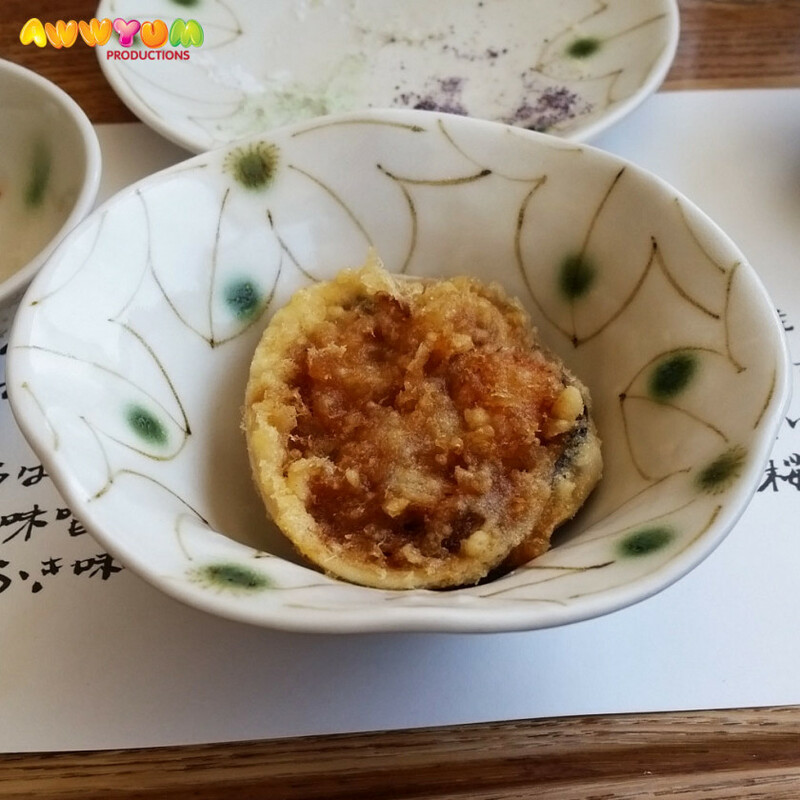 As a final course, we were served kaki-fry (left – small shrimps battered and fried in a big ball! ), eel (middle) and onion (right). All three were delicious. I enjoyed the kaki-fry, but after a few courses of tempura it started to feel a bit heavy for my liking. Overall this was a great start to my trip in Japan. The pricing for the meals were around 3000yen, which was very good value considering the variety and number of courses that we received. The food itself was all great. 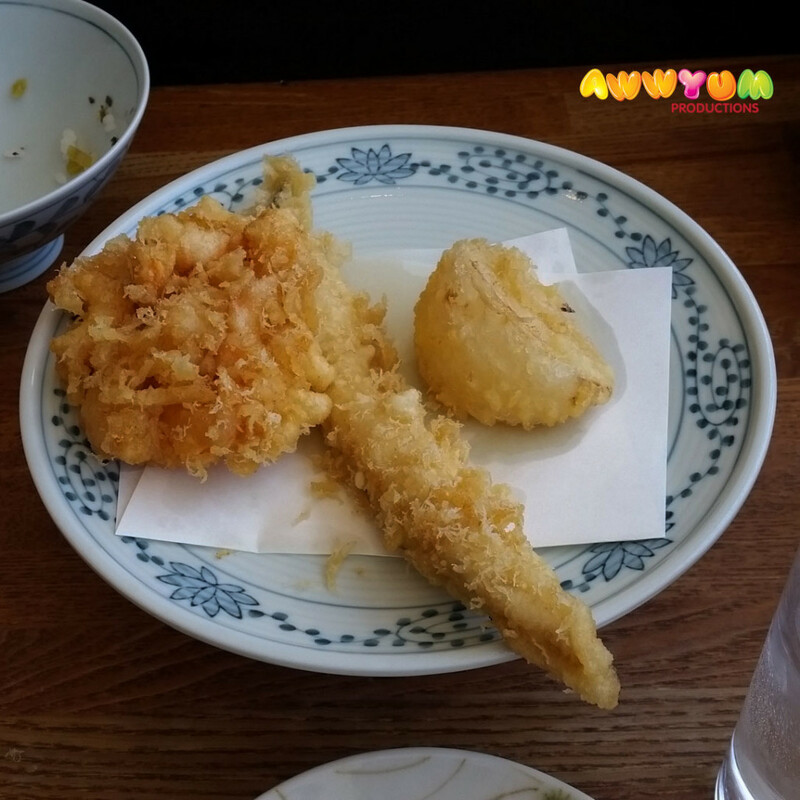 Every piece of tempura was well cooked and full of flavour. The quality of the ingredients were also very good! My only warning would be that a set can contain a LOT of fried food, so it may not suit everyone. That being said, I really enjoyed the meal overall! 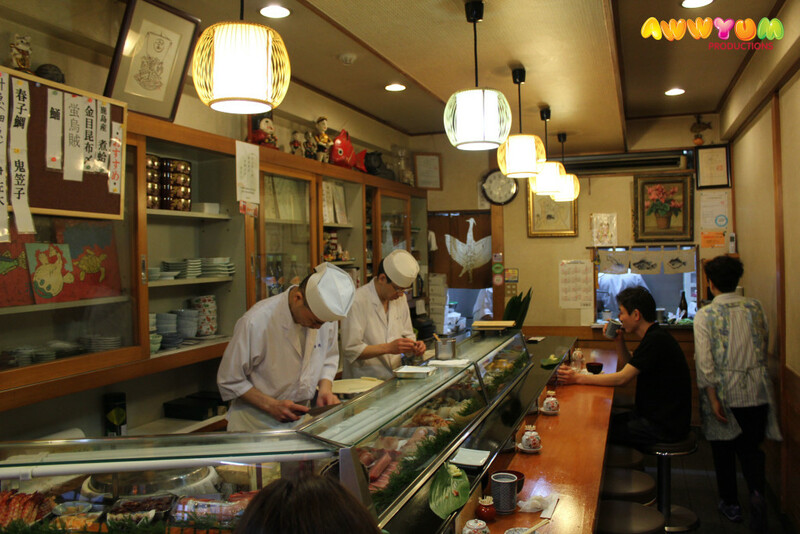 Finally, it is worth pointing out that the original Tsunahachi restaurant is in Shinjuku and attracts quite a crowd. I also believe that the menu slightly differs at that outlet. It is worth doing some research to see what you may prefer. 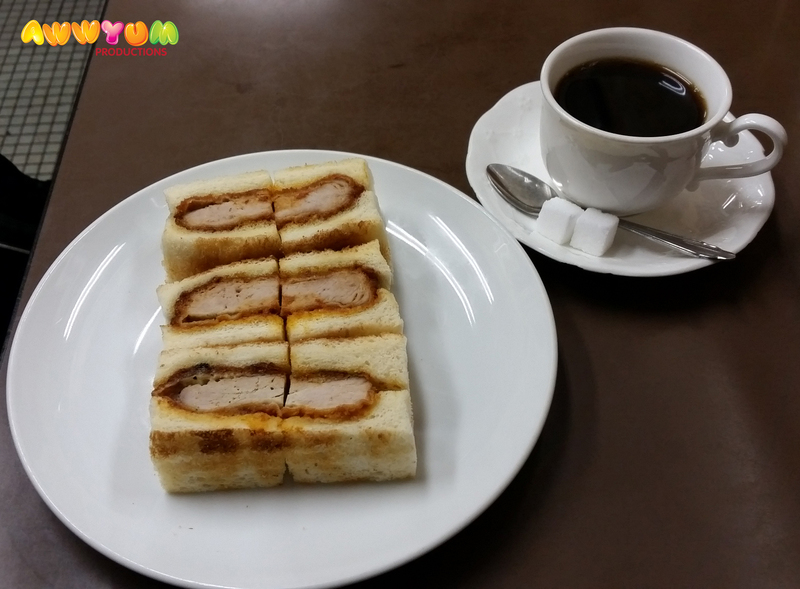 However, as a stand-alone, the Daimaru Tokyo Station outlet is very good! Definitely try it out if you happen to be commuting to/from the airport, or have a layover between shinkansen! 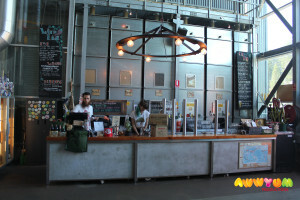 I had the pleasure of visiting Axil Coffee Roasters in Hawthorn twice in recent weeks. On both occasions the experience has been great! This review will feature pictures from both visits. The experience has been consistent throughout my two visits. 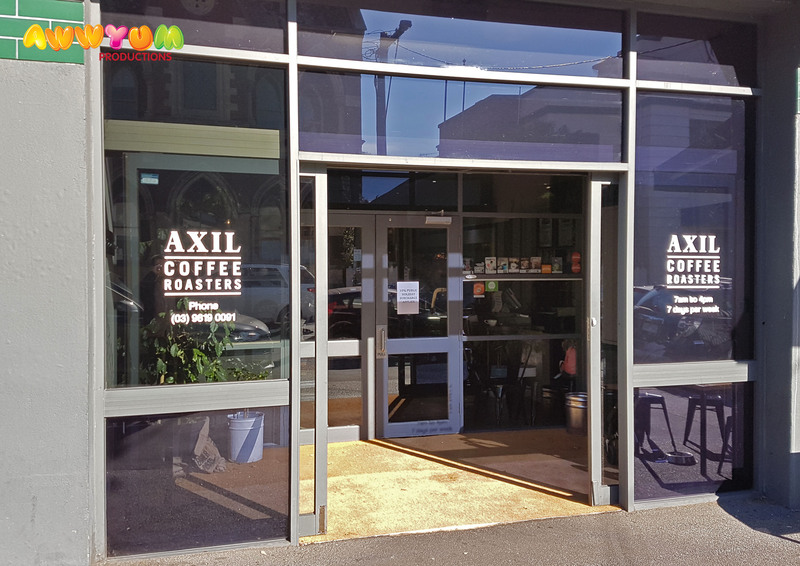 Axil Coffee Roasters is located in Burwood Road, Hawthorn, just around the corner from the Glenferrie Road shops. 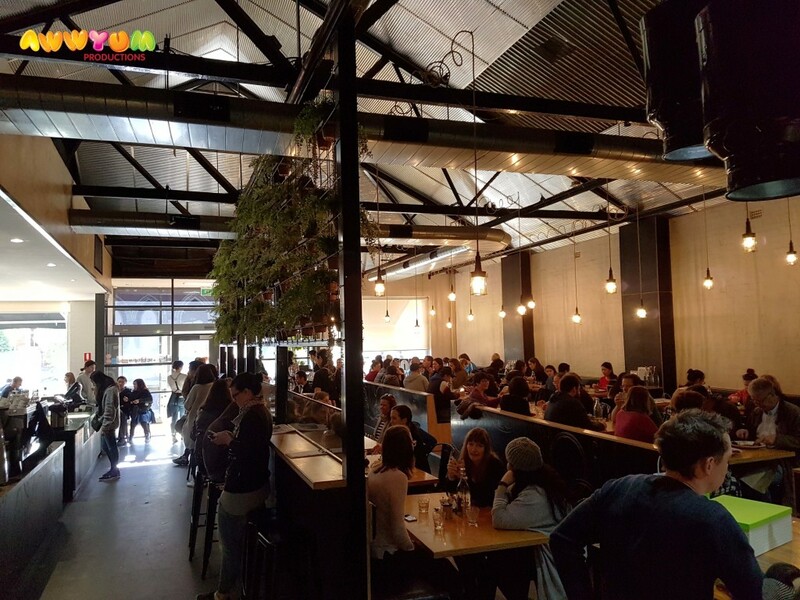 The establishment operates out of a big converted warehouse and the space is very open. 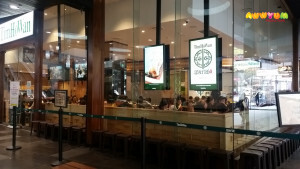 Inside there is a large section for dining, but there’s also sufficient space to pick up a take-away coffee. Even if you are waiting (and there is a good chance that you will need to wait for a table on weekends after around 10am), the waiting areas do not seem crammed. Needless to say, the focus here is on coffee! They have a good set up of baristas working tireless to make sure diners and takeaway orders are done promptly and effectively! 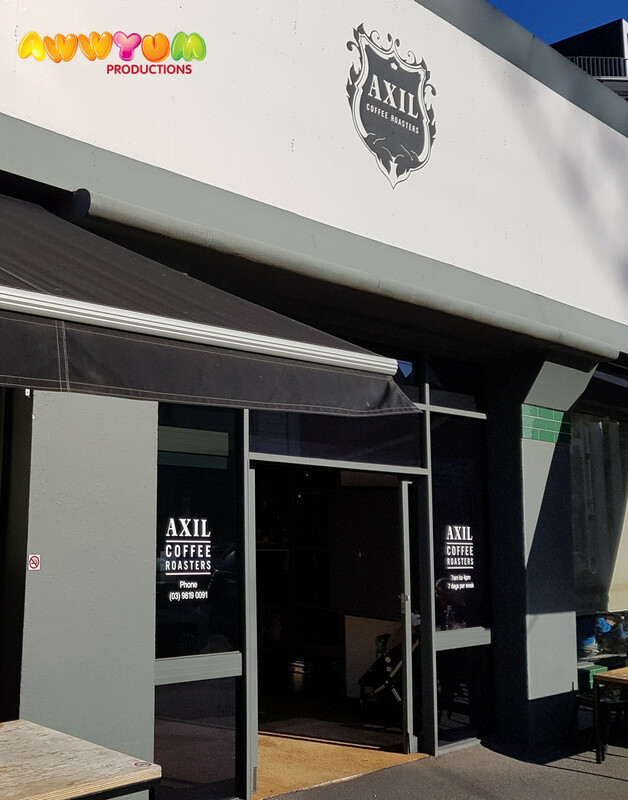 In addition to the coffee making, if you happen to wander down the back of the premises, you will also be able to see the area where Axil roasts their own beans and holds barista training courses. 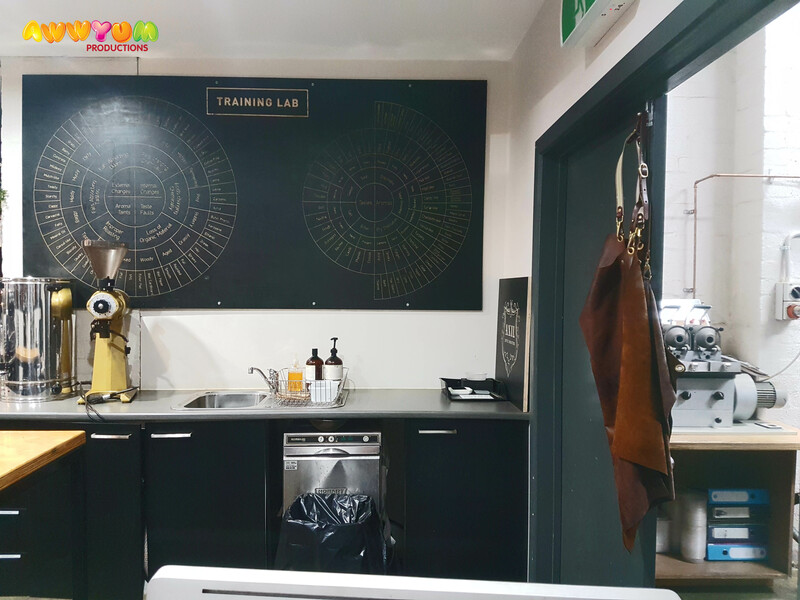 Unfortunately I didn’t have a chance to see the roasters in action, but I suspect that with all the commotion that goes on during weekends, roasting probably is left for the quieter times. 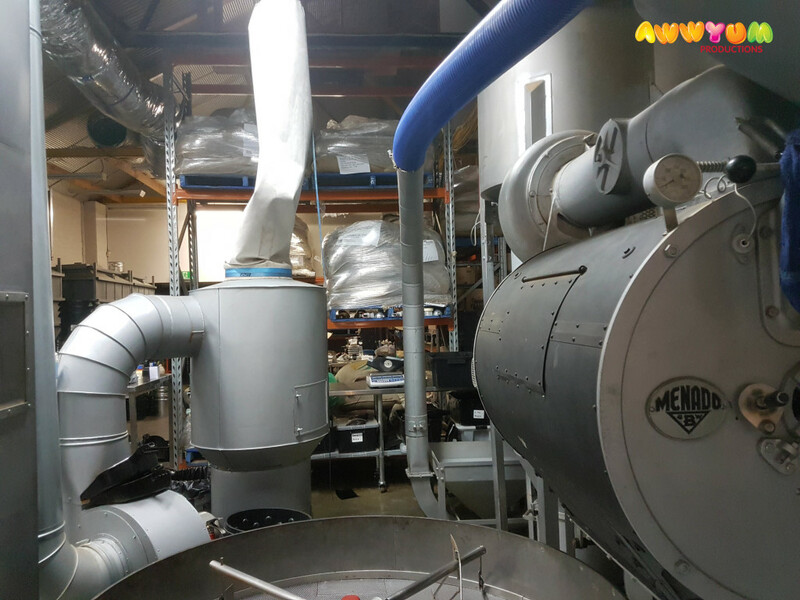 Having worked next door to a coffee roaster in a previous job, I know that the smell isn’t so pleasant for the uninitiated (ie, it smells like burnt toast!). The actual dining area is spacious enough. It has that warehouse/industrial feel to it, but the actual seating area also feels warm and inviting (hanging light bulbs anyone?). The service on both of my visits were great. Friendly (and non-pretentious) wait staff were also very quick and no-nonsense when it came to running orders. The food itself was also very good! I didn’t experience any ‘life changing’ dishes, but all food was very good and made to order using fresh ingredients. 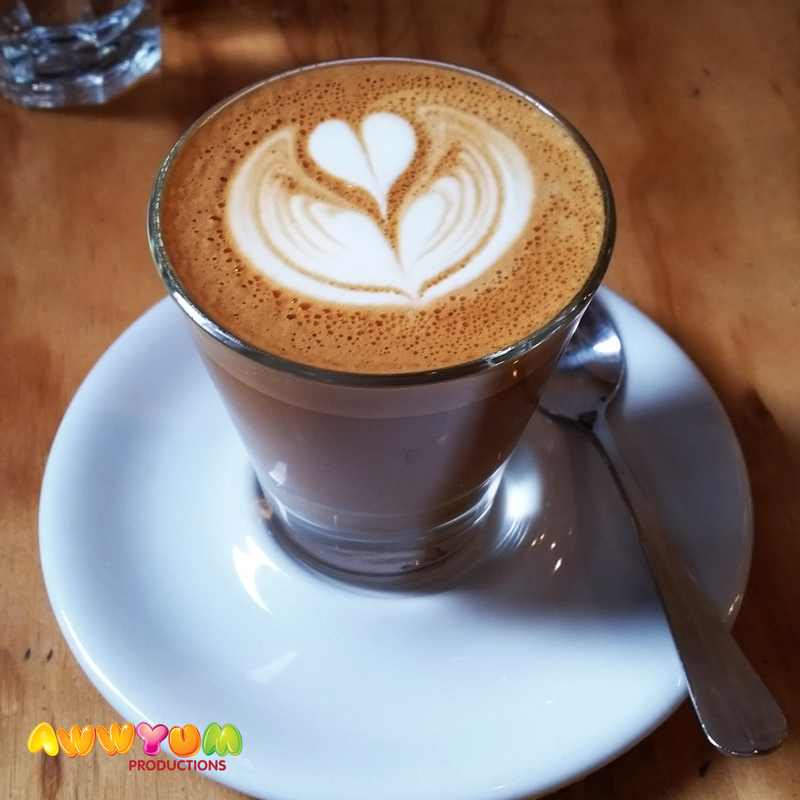 Better than most cafes you will visit, despite having a focus on coffee. Speaking of coffee, it was excellent! I just ordered lattes on both visits, but the blend they used was flavourful and well made. Pretty much faultless. If you’re more of a coffee aficionado then there are literally pages of blends and different preparation methods that you can try (ie, drips, pourovers, etc). My lattes were satisfying though! 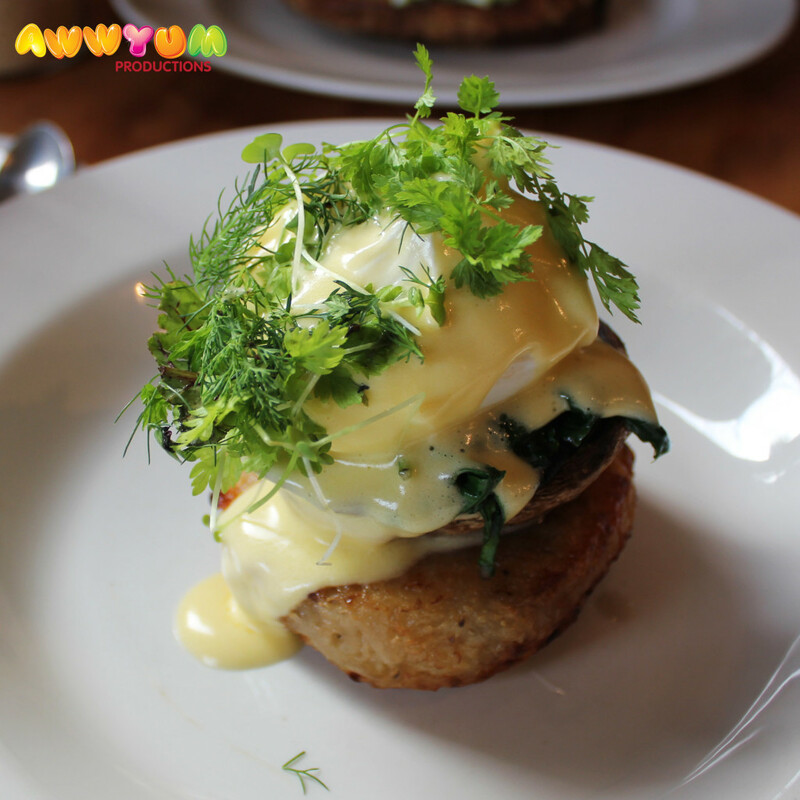 On my first visit, I ordered the potato rosti special, which is a potato rosti, mushroom, egg, spinach and hollandaise stacked up together. Everything on this dish tasted fresh and went together very well! The touch of fresh herbs on top also helped the dish! On my first visit, my friend ordered smashed avocado with feta. I recently talked with a friend based overseas and realised that we take for granted the abundance of avocados here in Australia. 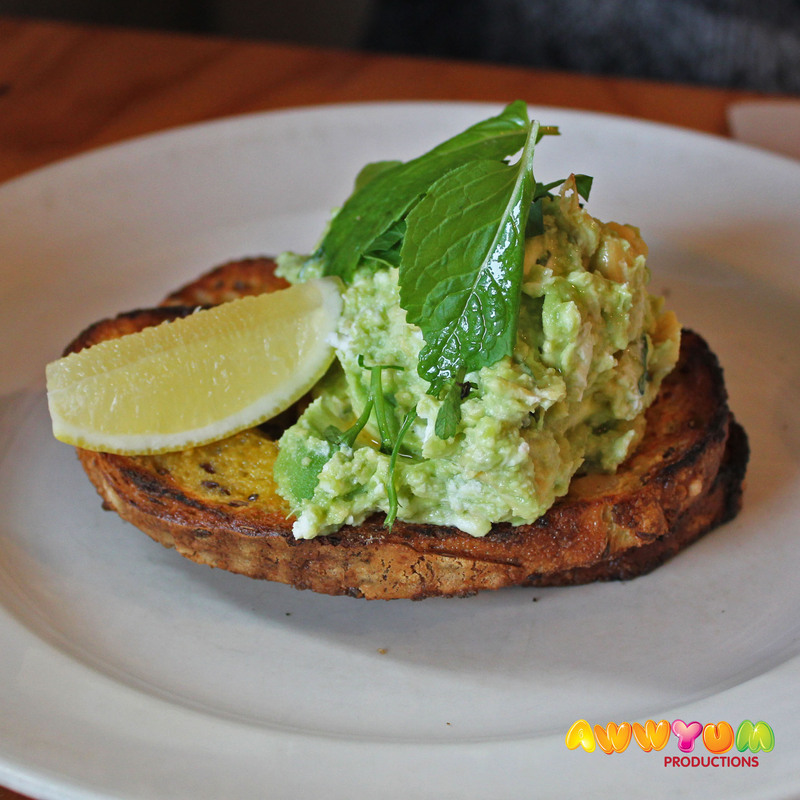 Smashed avocado is on almost every café menu here in Melbourne, but Axil’s looked as good as any out there! On my second visit, I was the only one to order a meal. There were many things on the menu that I wanted to try, but I went with the special for that day, being squid linguini. 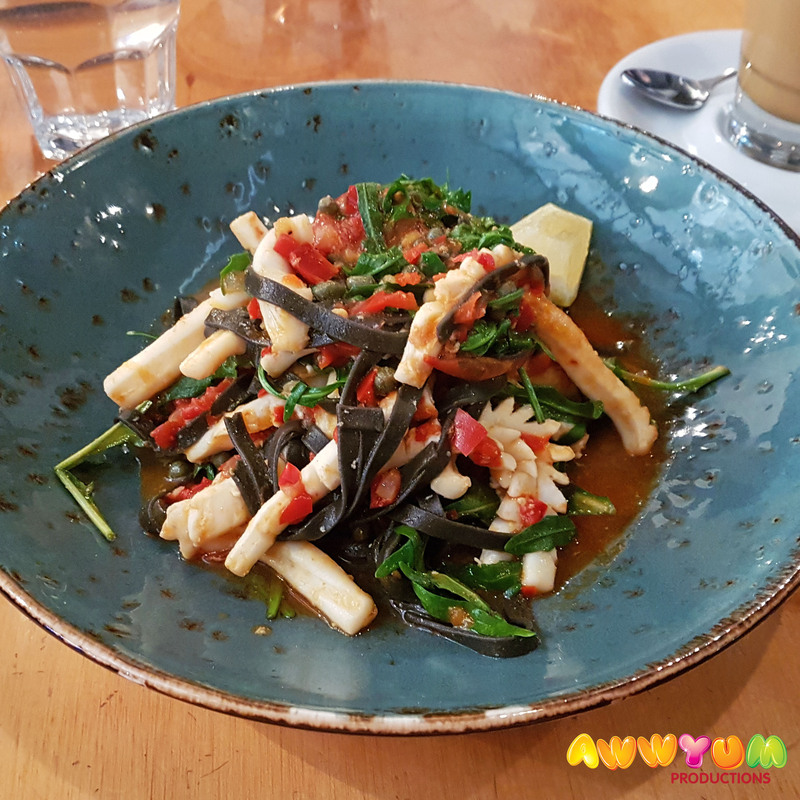 It was an interesting dish which featured squid ink pasta, loads of fresh squid, rocket and cherry tomatoes cooked/mixed together. The dish didn’t look like it would work, but it did! It ended up being a mix between a pasta dish and a salad though. Overall, my visits to Axil were both great. The atmosphere is busy, but spacious enough to be able to relax (when waiting and while seated). 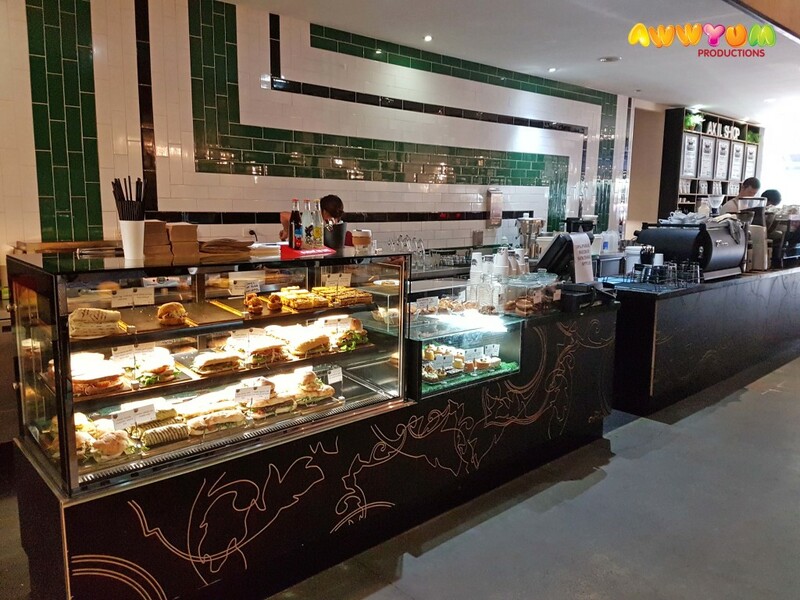 The food was great, the service was great, the coffee paraphernalia was great, the coffee is fantastic – definitely drop by if you are in the area. You will not be disappointed! My trip to Tsukiji Fish Market was not the most conventional one. 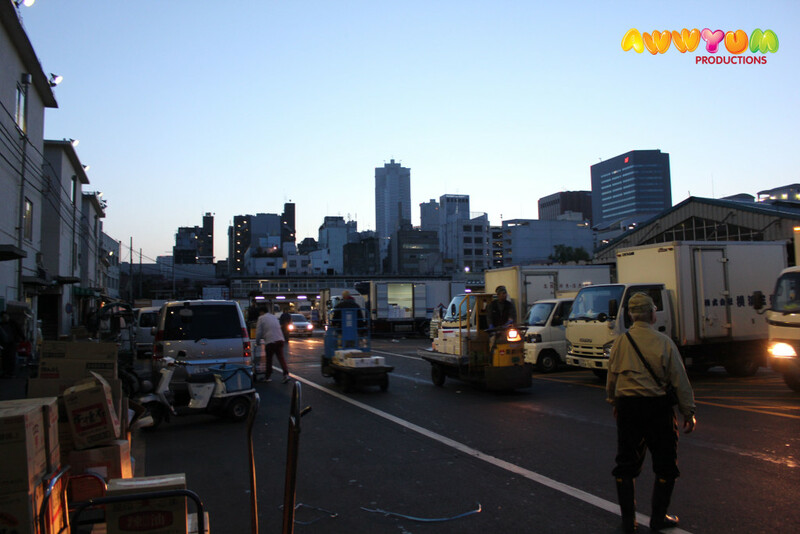 I was only staying in Tokyo for a short time and the only time I could visit the fish market was on my final morning in Tokyo (and needing to be at Narita Airport by 12pm to make check-in). In addition to my time constraints, I also had a ‘night out on the town’ the previous evening, which consisted of skewers, nabe (Japanese hot pot), and various beverages (‘Hoppy’ anyone?). But that will be featured in another post. Although the odds were stacked against me, here is my experience at the Tsukiji Fish Market. Because of the time constraints listed above, I needed to be on a train from Tokyo Station by around 10.30am, which meant that I needed to leave the fish market at 8am. Unfortunately I wouldn’t be able to visit the inside trading market which is usually opened to tourists from 9am – 10am. Instead, I hoped to be one of the 120 people to view the Tuna auctions. My plan was simple – arrive at around 3.30am to snag a spot, and then watch either the 5.25am viewing or 5.50am viewing. 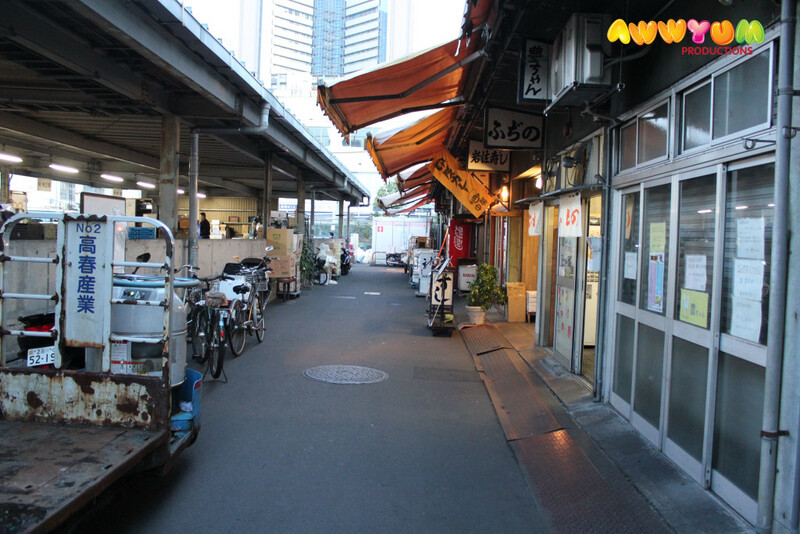 Once the viewing had finished, then it would be a perfect time to grab some sushi breakfast and explore the outer market on the way out. I finished the night-before festivities at around 1am, which only gave me a chance for a powernap before heading to the market. Surprising, the adrenalin was still pumping and I was certainly defying the odds by even staying awake! 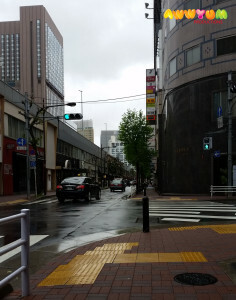 I walked from my hotel in Ginza to Tsukiji, which was a brisk 20min walk. 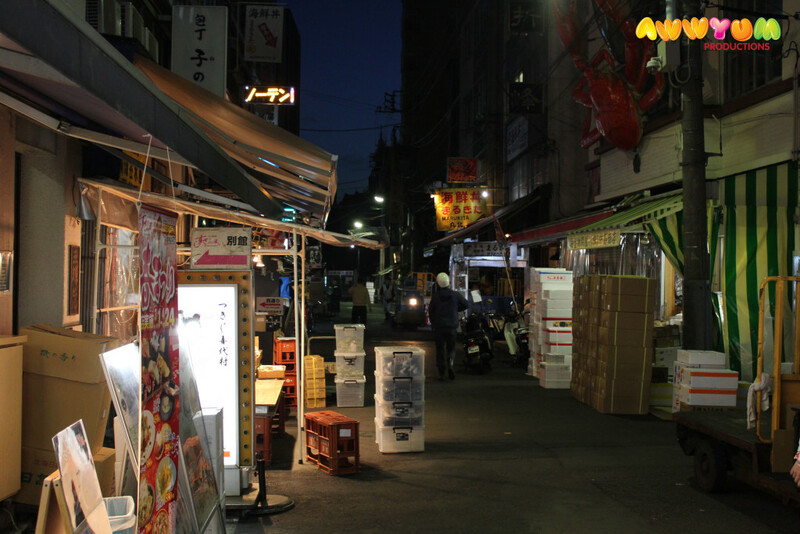 I eventually found my way to the meeting point for the tuna auction – a small outpost on the edge of the market complex, where two guards were standing. This was the big moment – I would finally be escorted inside and get to see behind the scenes…! However, unfortunately that morning I was too late! I arrived at 3.36am, and that particular morning (Monday 18 April 2016) the allocated was filled by 3.17am! Unbelievable!!! This left me in limbo for a while. I waddled through the ‘outer market’ which is like a shopping strip – being a series of roads and small alleys lined with shops (as opposed to an actual market complex). However nothing was open. 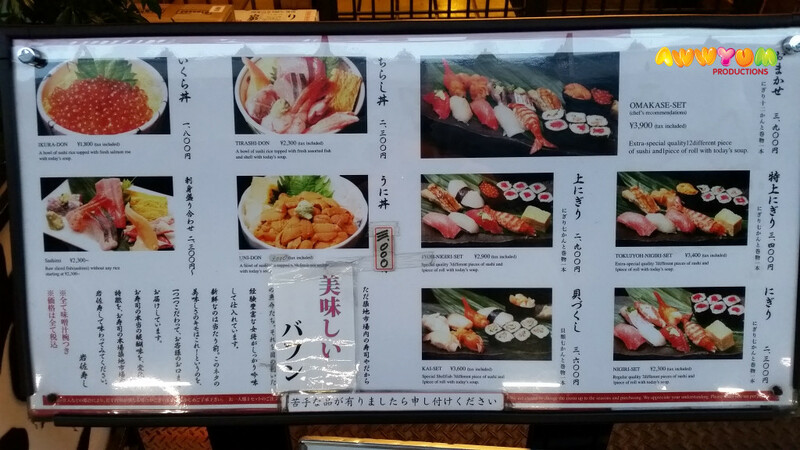 I also checked out the sushi restaurants located at the ‘inner market’. 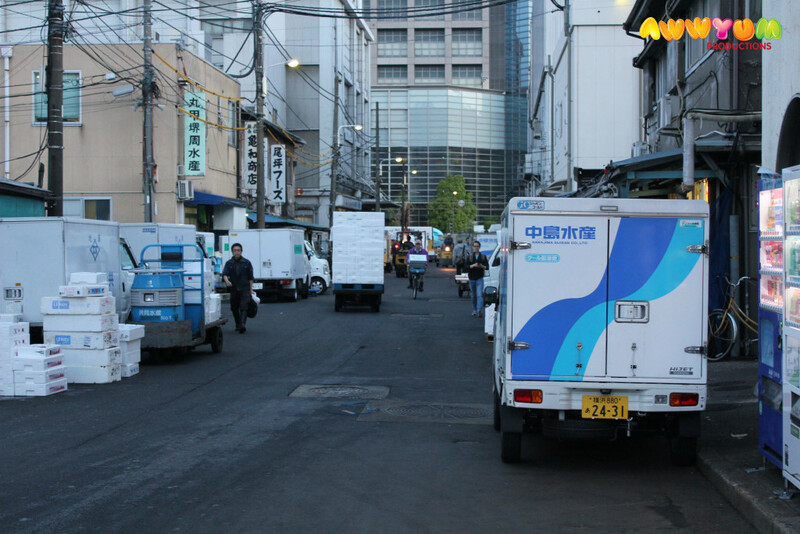 The usual suspects – Sushi Dai and Daiwa Sushi – had substantial lines from around 4.00am (none open at that time). I also saw Nakaya, which I read is a good alternative for their uni (sea urchin) and ikura (salmon roe). Sadly they were only setting up while I was there. 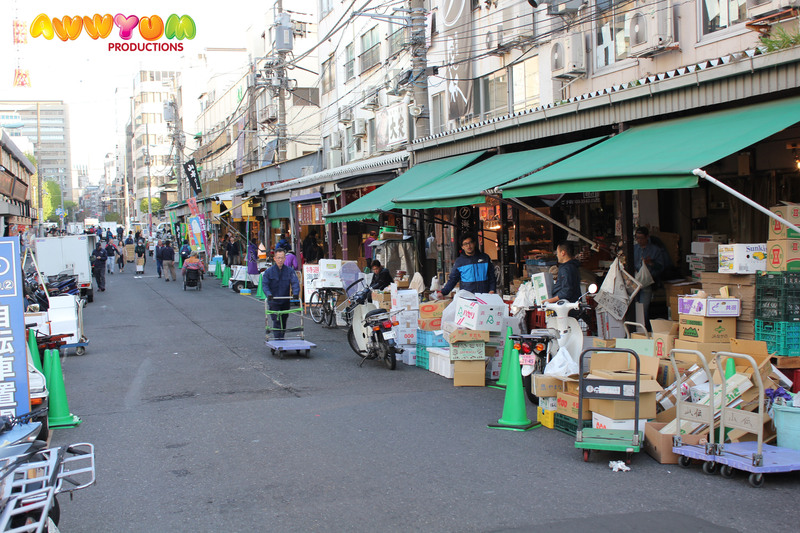 The market itself was abuzz with activity! 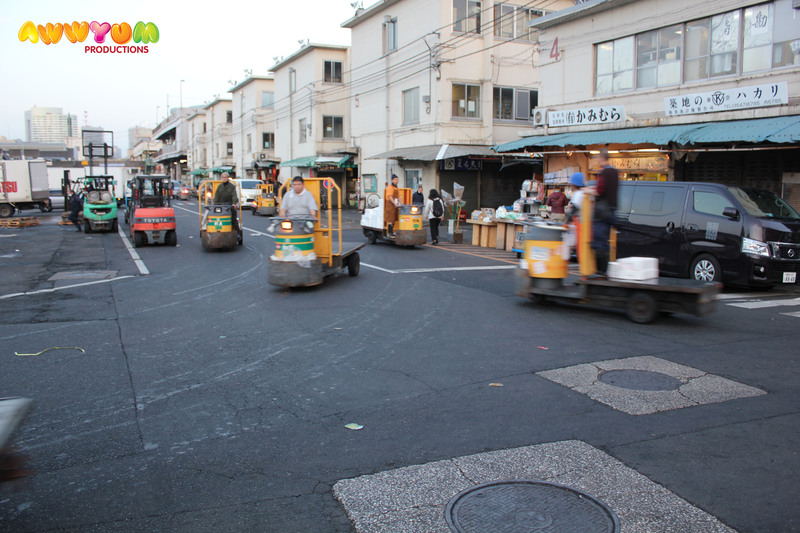 It was difficult to take photos without being bowled over by trolley-trucks (or even bigger vehicles!). 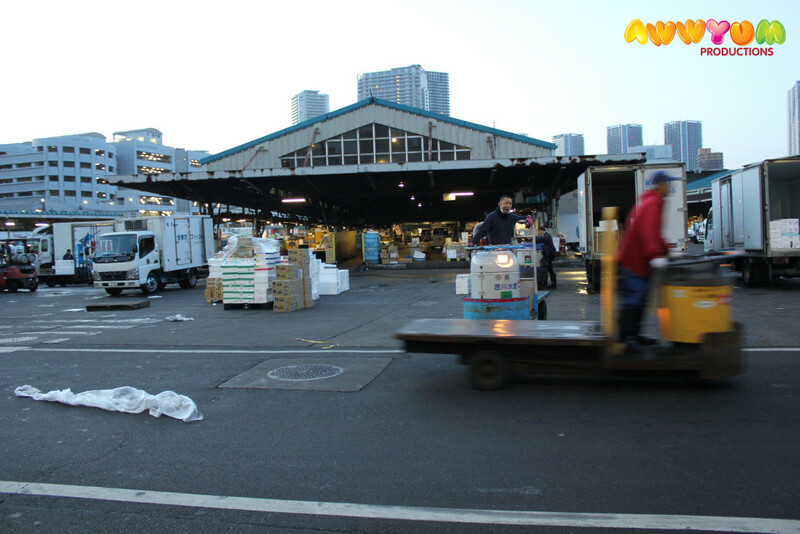 The size of the market was also evident from the number of customers loading their goods, as well as the sheer number of loading bays and platforms! Having (literally) done multiple laps of all the shops and stalls outside of the fish-trading area, I was starting to get hungry. Fortunately one of the restaurants, which I assumed catered for workers, was open and I quickly stopped in to grab a katsu sandwich and coffee. By this time it was around 4.45am… At 5am the sushi restaurants would start opening and I could at least indulge in my sushi breakfast! 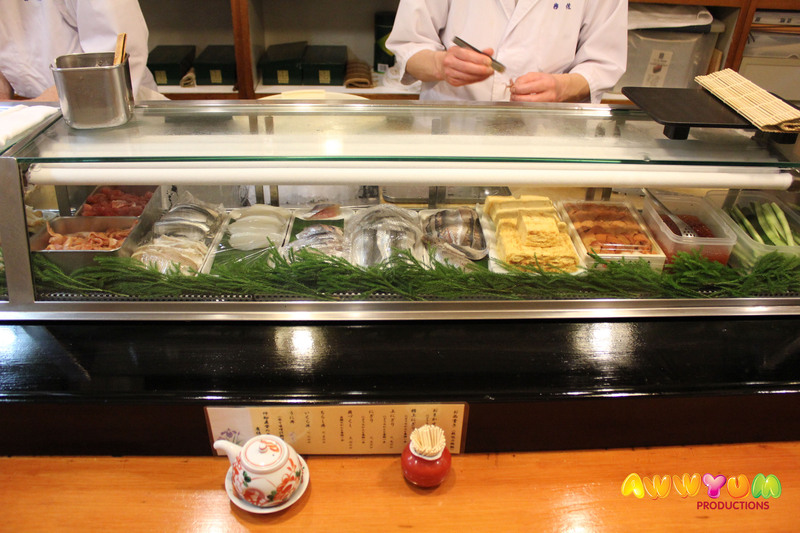 Having seen all the different sushi restaurants, and not having time to wait more than one hour for Sushi Dai or Daiwa Sushi, the one that caught my eye was Iwasa Sushi. 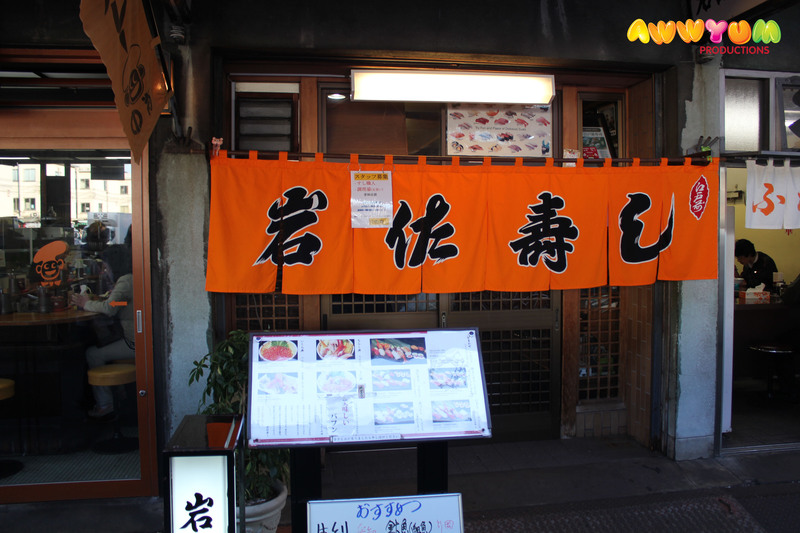 The signboard out front showed a good selection of sushi, and it also had a homely feel to it from the outside, due to the orange banner. 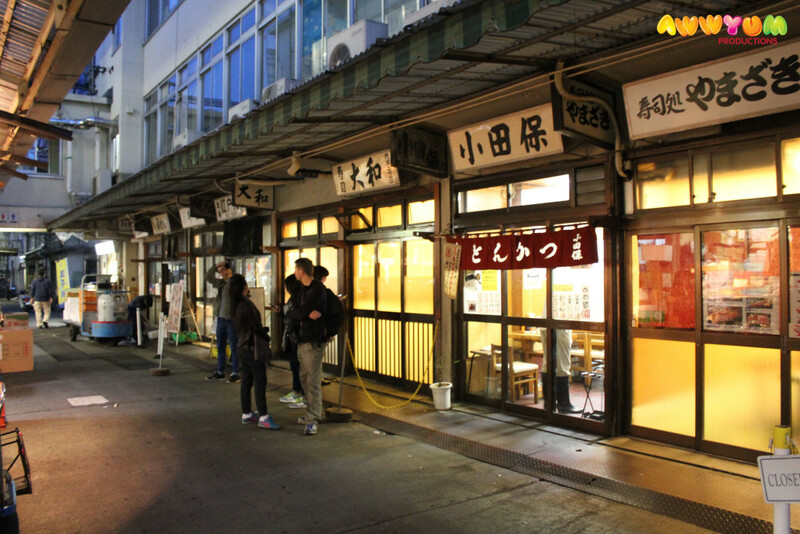 Iwasa Sushi is located at the Inner Market of Tsujiki Fish Market. But it is not in the aisles where most of the restaurants (and queues) are. Rather, it is in a separate row located behind a loading dock, but not that hard to spot. It was also open at 5am, which was handy. I went in and was not the first customer. 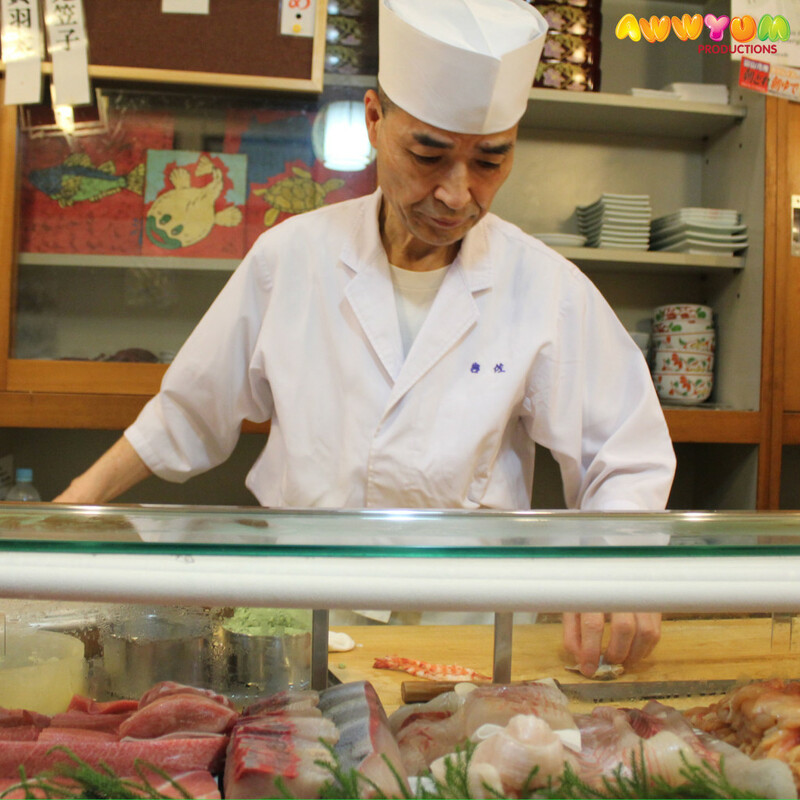 There were 2 groups of Japanese customers who were ‘ordering up’ (one piece at a time) from the sushi chefs! I had a good feeling about the place! I really enjoy seafood. Fishing is also a pastime of mine. So fresh fish, prawns and shellfish are all fine for me. The selection at Isawa Sushi looked amazing! It was all there for the customer to see behind the glass. 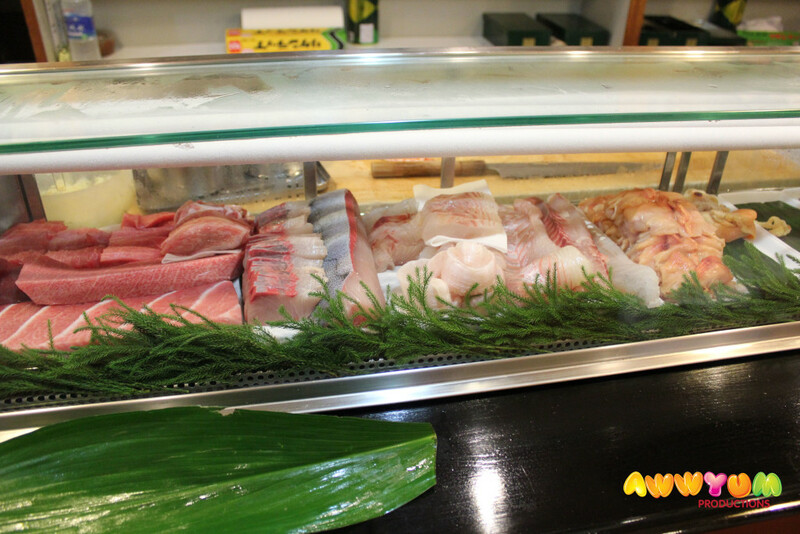 Isawa Sushi is known for its clams and shellfish selection. However, as I was only going to be at Tsukiji for one morning, I simply uttered one word – Omakase (chef’s selection)! The chef then got to work and started preparing me a feast! I was so full after this, but it was very satisfying! 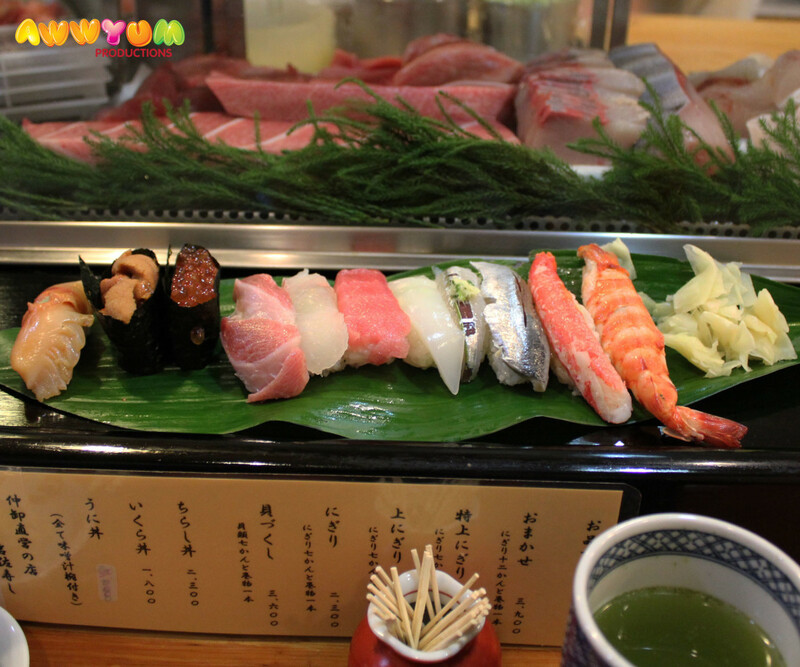 The set featured everything that you would expect from a high end sushi meal – prawn, crab, uni (sea urchin), ikura (salmon roe), otoro (fatty tuna belly – highly prized!) and squid (in addition to a range of fish sushi!). The meal also included clam soup (yum! ), cooked eel sushi (not pictured), and a salmon and cucumber maki roll (small sushi roll – also not pictured). After such a long morning, the quality of the food and the service at the restaurant (all smiles – very friendly!) was such a welcome relief! The restaurant also was not full, which meant I could spread out a little bit (rather than be squeezed in!) and enjoy the meal and atmosphere! Overall, this was a very good meal. The omakase itself was very generous in its variety, the staff and chefs were friendly, and the quality of the sushi was very good! If you happen to visit Tsukiji Fish Market, Isawa Sushi is definitely worth a try! 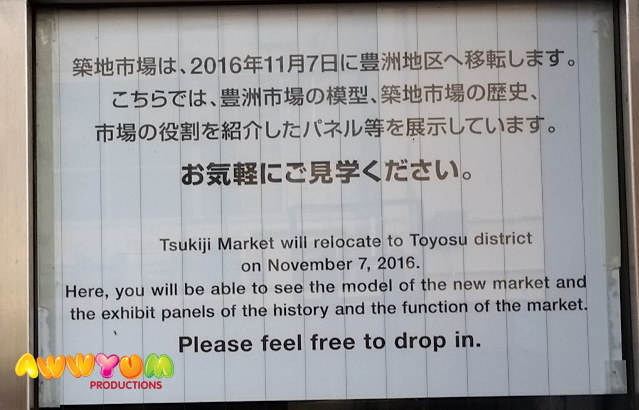 From 7 November 2016, the Tsukiji Fish Market featured in this review will be moving to Toyosu district. The new site will apparently be 40% bigger, with new facilities. It is an exciting prospect, but unfortunately the history/tradition of the original site will disappear. 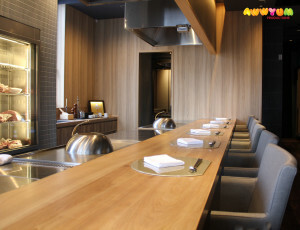 I am unsure what will happen to the sushi restaurants like Isawa Sushi as part of the move. Lets hope that they will continue serving great sushi at another location! 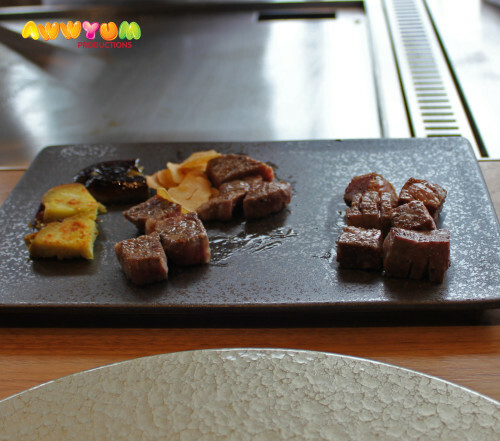 One of the highlights of my trip to Tokyo in April 2016 was trying Kobe Beef! 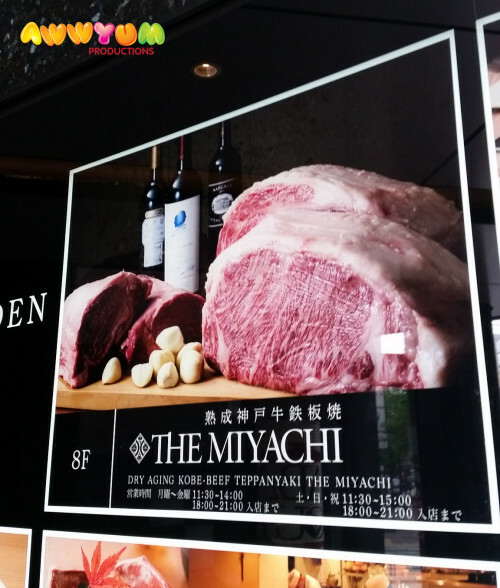 The options for Kobe Beef in Tokyo are actually quite limited. 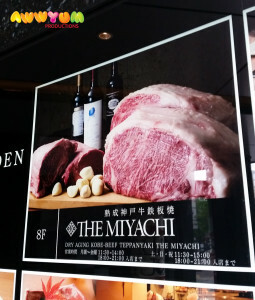 If you do a search online, you will probably only be able to find up to a dozen places serving true Kobe Beef in Tokyo (possibly more if you search in Japanese!). 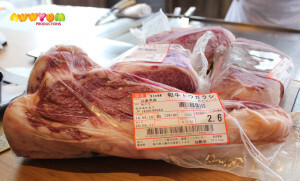 What’s more, Kobe Beef is extremely rare to find overseas. 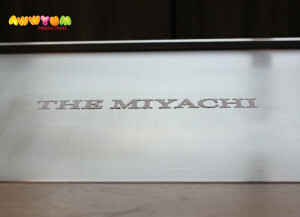 I chose to try The Miyachi, which is actually one of three restaurants run by the ‘Ginza Miyachi’ group (Ginza-miyachi.com). 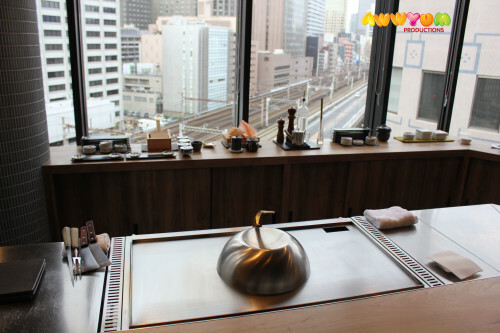 The restaurant itself is located on the outskirts of Ginza, close to the Shinkansen line and bordering Shimbashi. It was a particularly wet day, but thankfully it was well signed, assuming that you can find the right building. The interior was immaculate compared to the dreary weather that day. 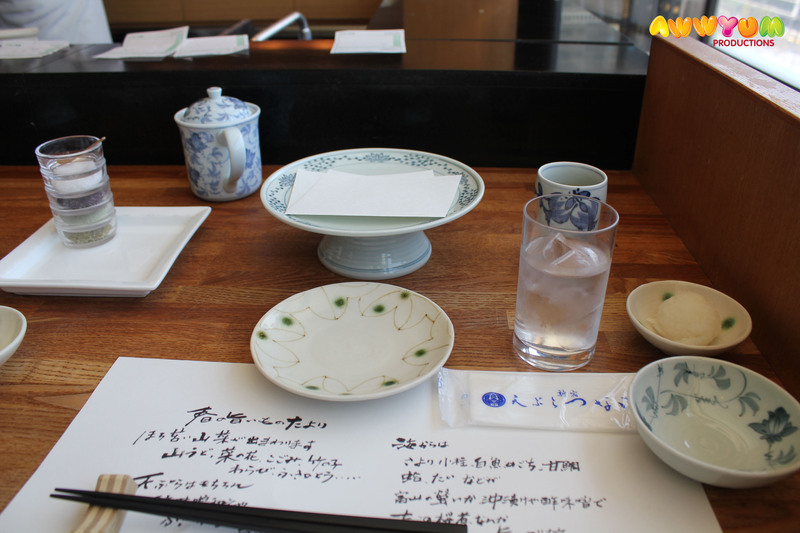 I dined with a Japanese friend. Once we had both arrived at the restaurant we were seated and our set menu began to be prepared. We went for lunch and ordered a 5000yen set which included Kobe Beef and another cut of dry aged Wagyu beef. They also have a number of different set courses for lunch, as well as more extravagant dinner set menus! (nb. 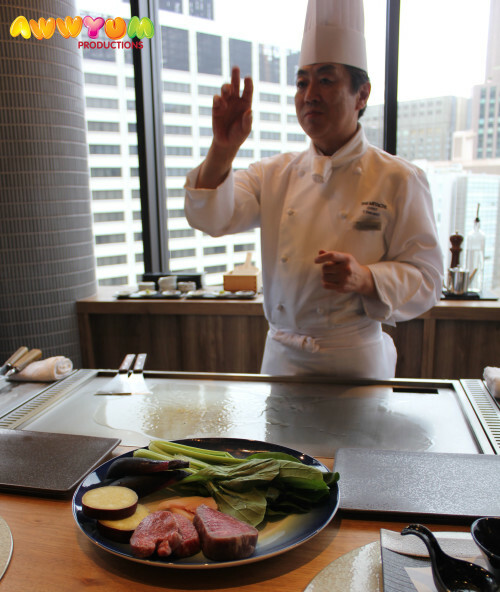 at the time of writing, this same set that we ordered does not include Kobe Beef – I was very fortunate!). 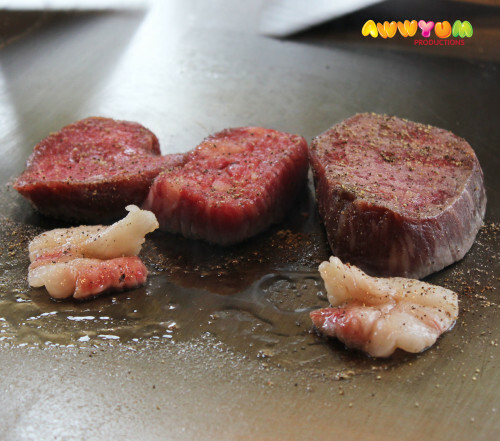 In the picture below, the Kobe Beef is the two smaller fillets on the left side. 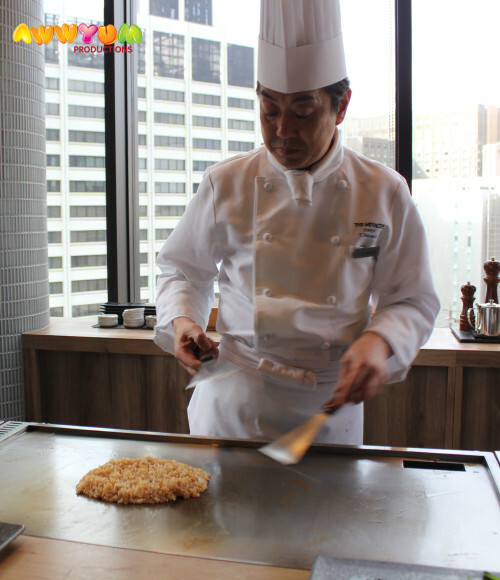 We had our own chef who explained a few things to us (mainly in Japanese, but he spoke some simple English too), and then got straight onto frying the vegetables. We were offered an appetizer of salad, as our veggies were being cooked. As things were cooking, our chef then showed us a few different cuts of Kobe Beef that they served. The pic below is a sirloin/porterhouse (ridiculous marbling!). 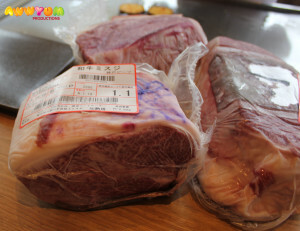 Below is a picture of the various cuts including scotch fillet and possibly rump. The Kobe Beef is branded with a unique purple brand, which can be seen on the picture below. 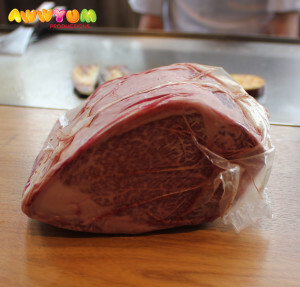 Featured in this picture below the cut that they serve with the lunch set – a ‘thigh cut’ off the bone, which is butchered into a roll/fillet and sliced into steaks. The last cut that he showed us appeared to be the most prized. The shape and marbling is a bit misleading, but I am pretty sure that it was an eye fillet (or possibly scotch fillet). By this time my mouth was almost literally salivating! Thankfully the vegetables were ready, and the meat was on the grill! They were plated a little staggered, but that was no problem! We chose to have our rice ‘upgraded’ to garlic fried rice. 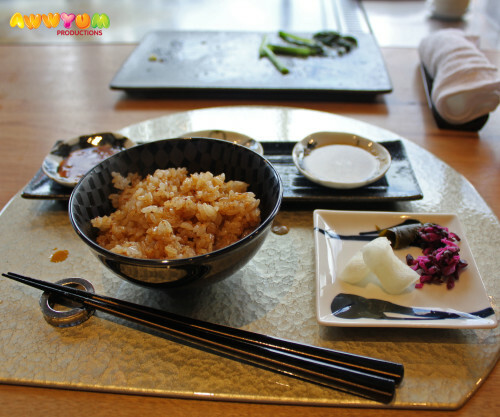 This was fried up and served as a separate course with pickles and miso soup. As a final course, we were served dessert and coffee. 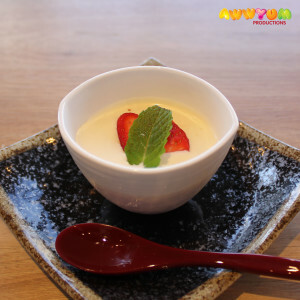 The dessert was a panna cotta style custard. The coffee was filter coffee, but still not a bad accompaniment to finish the meal. Needless to say, the meal overall was excellent! The service and setting were both top notch, and we were very fortunate to have a friendly and passionate chef cook for us that day. As for the beef itself, I have to admit that I came with low expectations – we are fortunate to have some great beef in Australia, and because of that I was yet to experience a truly memorable steak outside of Australia. That being said, both the Kobe and other type of beef (from Kumamoto prefecture) were very good. If I had to compare one with another, I would actually say that the non-Kobe was a bit more tender! I also had low expectations because of the value of the lunch set (which was very good value at 5000yen!). 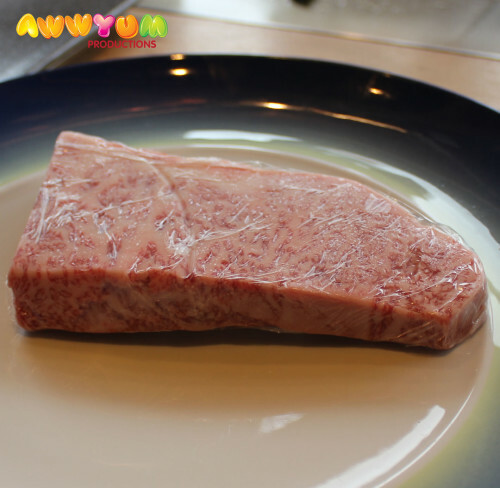 I did not expect a prized cut such as a sirloin or eye fillet, however, the cuts that we were served were better than most steaks that I have tasted. However, it was the overall experience that made this meal great. A combination of the setting, service, good food, (and good company!) really made this is a highlight of the trip! 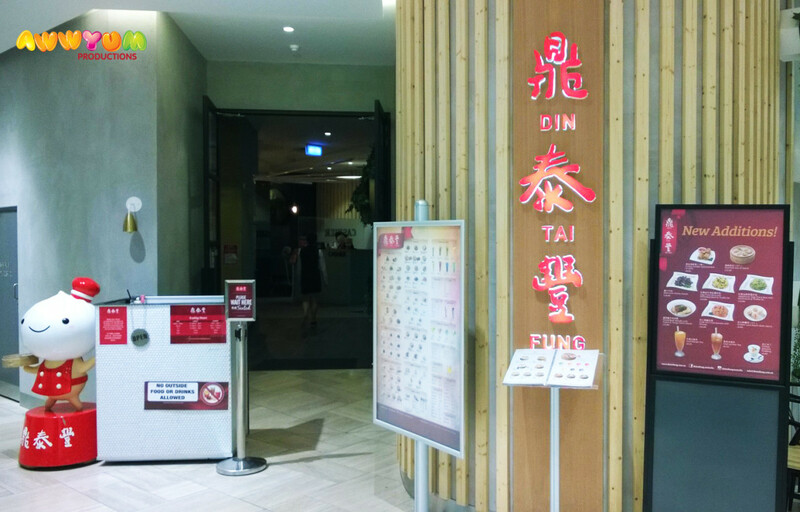 Din Tai Fung is now a popular restaurant chain throughout Asia and Australia. 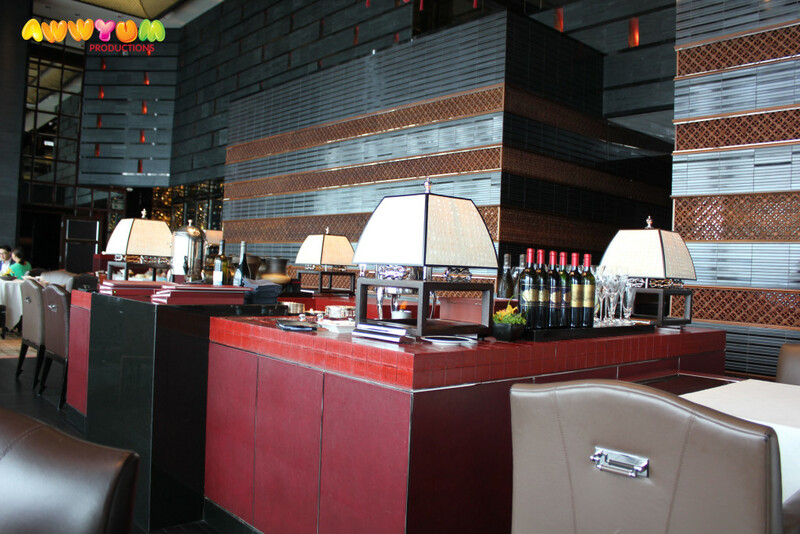 The restaurant has its roots based in Taiwan and serves Taiwanese food, as well as some Shanghainese style dishes too! The Melbourne store, which I visited in mid-May 2016, has been open for about a year (opened June 2015). 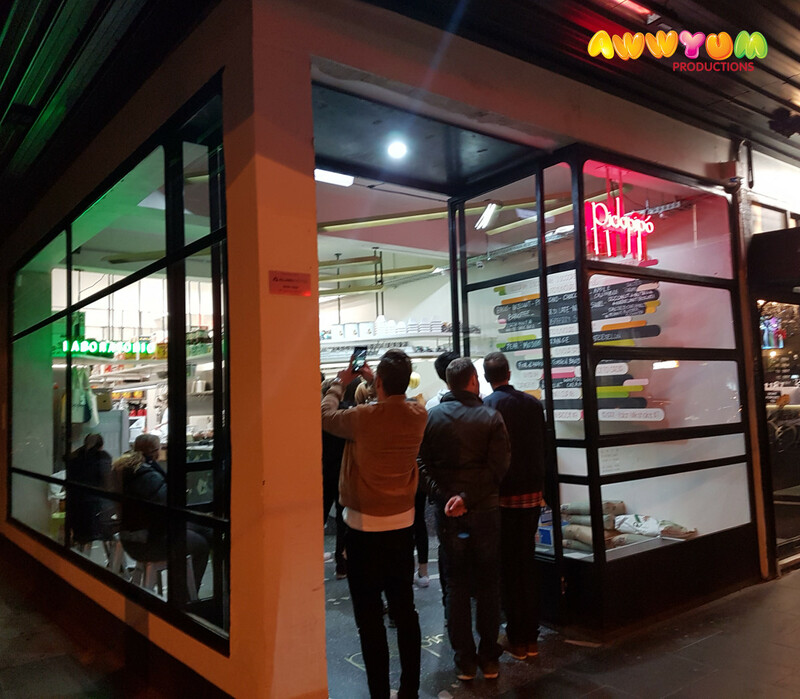 It opened off the back of successful restaurants in Sydney and throughout Asia. The chain has a number of accolades and awards. It features in many cooking and travel shows, as well as its Hong Kong branch(es) featuring in the Michelin Guide in recent years. I visited the Melbourne store with high expectations. I have been fortunate enough to try the Sydney store (which has been open for a number of years!) at World Square a few times, as well as the branch in Central World, Bangkok. Both of those restaurants are very good! So how does Melbourne stack up? Din Tai Fung is located on Level 4 of Emporium in the CBD (if in doubt, keep going up the escalators on the Swanston Street side!). 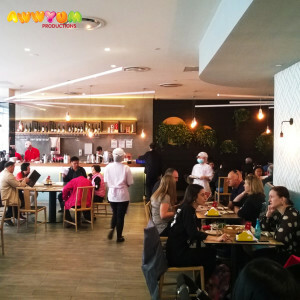 I visited for an early Friday lunch, and thankfully there was no queue, although I did notice a large pile of portable buzzers (and a large foyer area) for when the crowds roll in! The restaurant itself is huge! 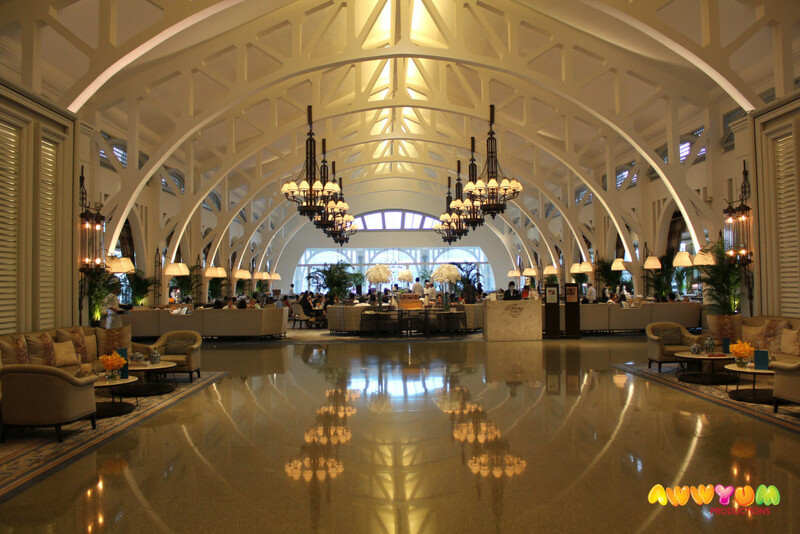 The seating area is in a large ‘L’ shape and there are tables spread throughout. Apparently it sits more than 200 people (not surprising based on what I saw)! The seating was not cramped despite its capacity. As with all Din Tai Fung restaurants that I have visited, the kitchen and prep area is in clear view. I observed the army of workers hastily making their most famous dish – Xiao Long Bao (Shanghainese style soup dumplings). They have a big menu! 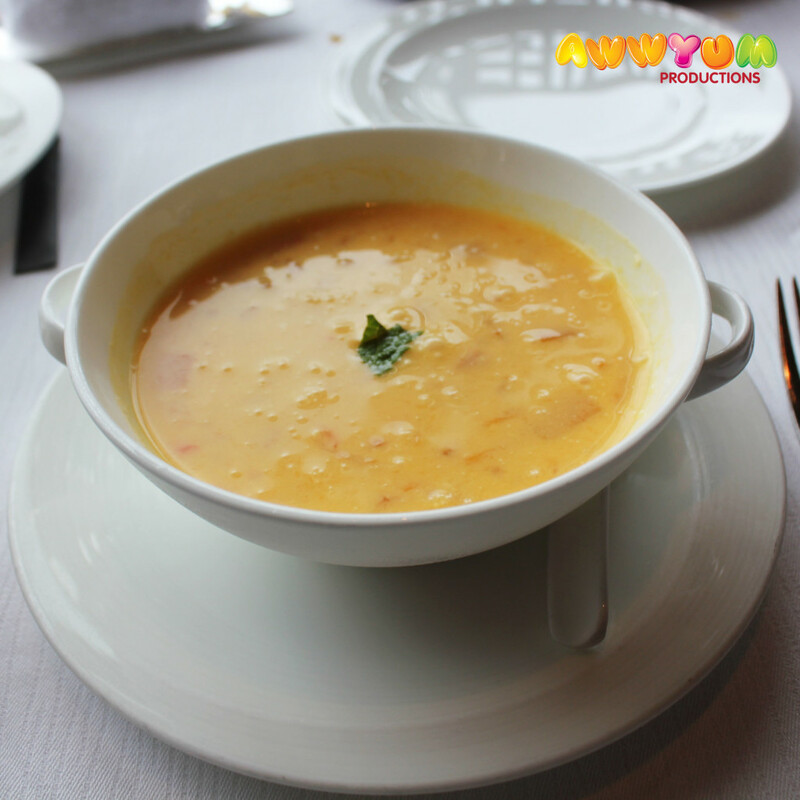 I would not recommend going solo like I did – particularly if you want to try a variety of dishes. I was hungry, so I ordered pork chop with fried rice, as well as a serve of their chilli oil dumplings. Although it was seemingly the most ‘Western’ item on the menu, its also probably one of the most ‘Taiwanese’ dishes also. I haven’t been to Taiwan, but pork chop always features in Taiwanese Cafes, and Hong Kongers are also fond of this dish. Regardless of how it is classified, the dish is delicious! The pork was full of flavour (maybe a tad salty) and fully de-boned. The rice (mixed with egg and spring onion) balanced the chop well and was perfectly cooked, as would be expected. Great dish! The chilli oil dumplings were satisfying also. Inside the dumplings were a mix of shrimp and pork, but there’s also a pork/vege option. No problems with these, although the sauce is not as spicy as it claims. I was eating my dishes with the chilli oil condiment and the flavour of that dwarfed the sauce (great chilli oil though!). No problems with the dumplings! Its worth mentioning that the service was very good. 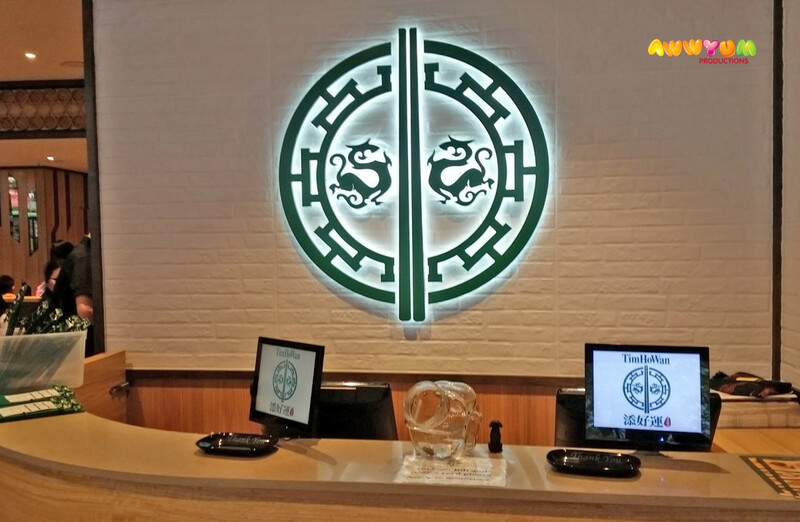 They have a ‘canteen style’ ordering system like Tim Ho Wan, but the waitresses were very helpful and friendly. The food and tea came out like clockwork. 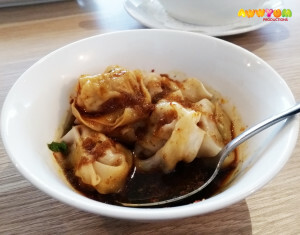 If the rest of the dishes are as consistent as the two that I tried, my recommendation would be to try the xiao long bao, as well as the Taiwanese beef soup – these two dishes have been really good at the other branches that I have tried. Overall it was a good experience for lunch. 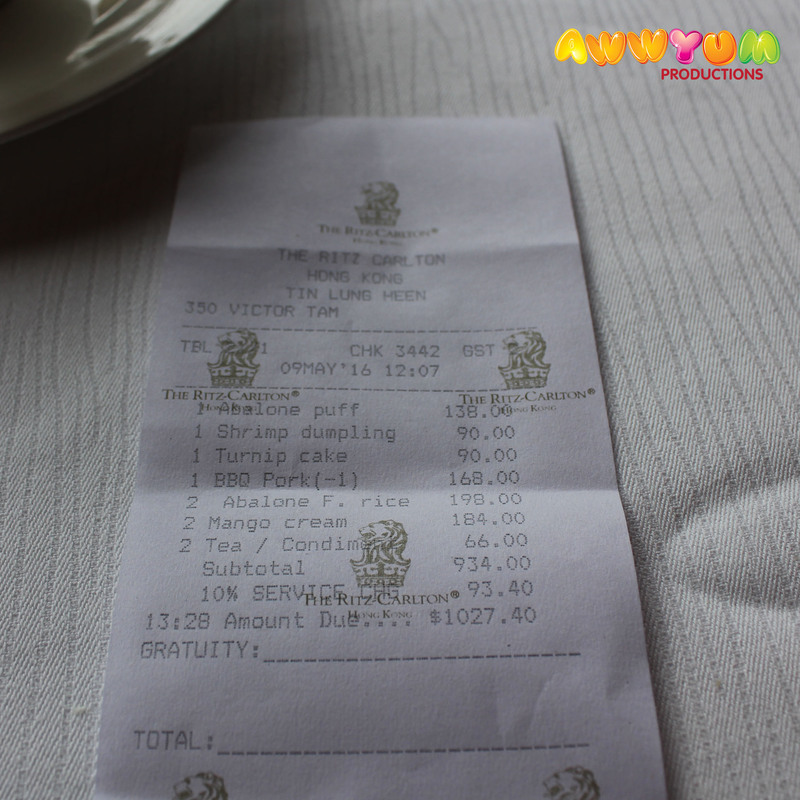 Unfortunately a little pricy (around $30 for 2 dishes and tea), but I ate well. Definitely worth coming in a group for next time. 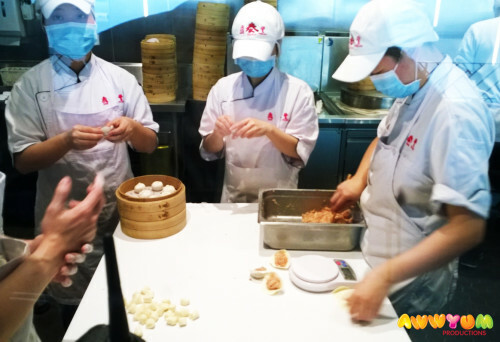 If you are a fan of Din Tai Fung then please check out our Instagram account (links below and on the side), as we have recently had an epic meal at Din Tai Fung Bangkok! 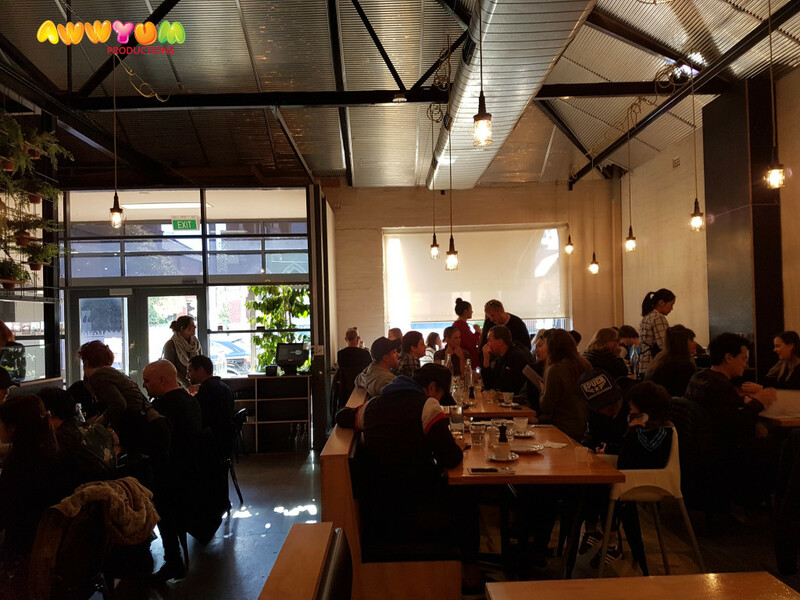 The Melbourne yumcha scene has always been strong. For as long as I can remember there were good places for yumcha, the old hands such as Sharkfin Group and Dragonboat are still around today (and still quite popular). 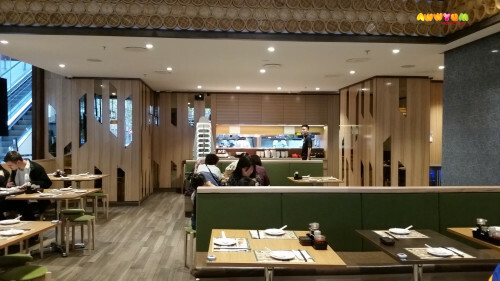 Enter Tim Ho Wan, a no frills yumcha ‘canteen’ which opened as a humble store in Mongkok, Hong Kong and has now spread to several branches (around 6) across Hong Kong, and more recently throughout South East Asia and Australia. Melbourne’s yearning for Tim Ho Wan was quelled in March 2016 when the store opened. You have probably heard about the hype and backstory before: chef Mak works at 3 Michelin starred Lung King Heen; goes it alone by opening Tim Ho Wan; attains a Michelin Star in 2 years; becomes the world’s cheapest Michelin starred food; famed pork buns; long queues; popularity; growth and expansion! So, does it live up to the hype? 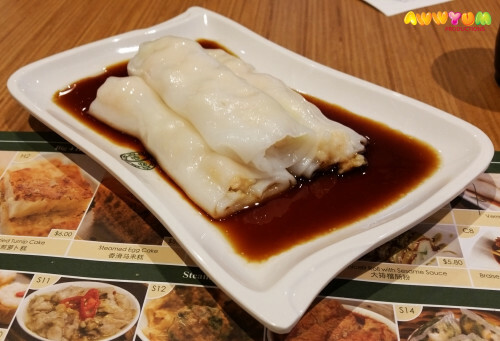 Here’s my experience of Tim Ho Wan Melbourne in mid-May 2016. Firstly, I was very fortunate to have visited at the right time. I was in-between meetings in the city and stopped by for brunch at 11am. There was no queue. I walked straight in and was given a table. Inside it was only about half full. The service was attentive enough, I was seated and then had the canteen style order form and picture menu in front of me. As I was dining alone, my choices were limited. However, I went for the pork buns (a ‘must try’, right? ), rice noodle (cheong fan) with shrimp, and mango sago with pomelo for dessert. A two course brunch! I had already visited Tim Ho Wan in Bangkok (twice! 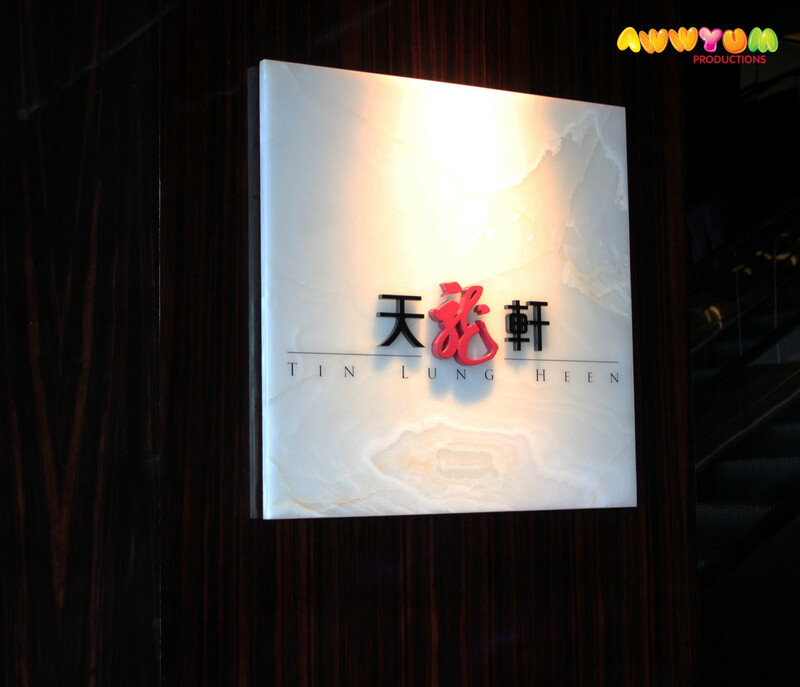 ), as well as one of their officially starred restaurants in Hong Kong (North Point branch). At both locations I had tried the pork buns. I have to admit from the outset that I’m just not a big fan of the actual dish. The buns themselves (in Melbourne) were well presented, crispy on the outside, tinged with a sweet crust and filled with sweet pork filling (everything right). 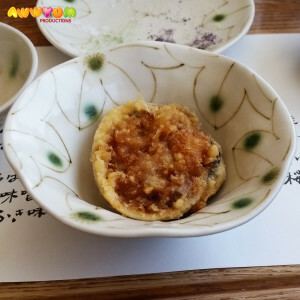 However, the dish itself, although well presented just isn’t something that I bite into a go ‘wow’ – perhaps they’re a bit too sweet for me. That being said, it was exactly what I ordered! They were also on par with the buns I had tried overseas. The second dish was the rice noodle shrimp. It was a nice dish. 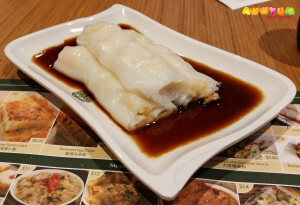 The filling was flavourful and the rice noodle texture was very moreish. 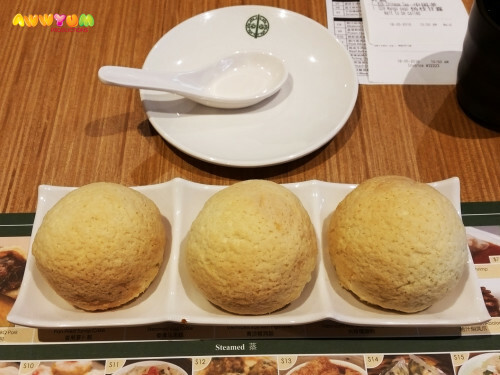 However, I was a little disappointed at the lack of shrimp in the dish – inside the rolls were a shrimp mixture as opposed to whole shrimp (or large chunks of shrimp). My dessert was held over until I had finished the hot food (nice touch!). It was really good. The soup had a good mango flavour which was balanced out by the more sour pomelo segments, and the sago ensured that the dish had density and substance. By comparison, I had really wanted to try this in Hong Kong (when I travelled in April), but had to settle for another dish that wasn’t so good. Great dessert on the menu in Melbourne though! Although the above may seem critical, on the whole it was a pretty satisfying meal. The service was good enough, the food standard was good and the price was also quite reasonable ($24 for a filling two course meal). Can’t wait to come back with some friends to try a few more dishes! 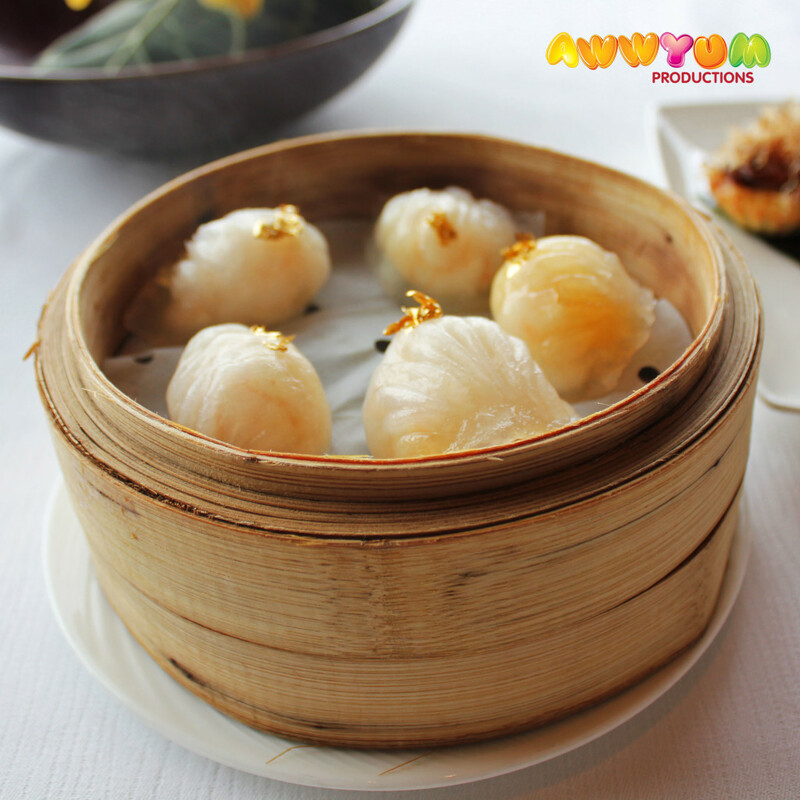 Definitely a must try if you’re a yumcha fan. 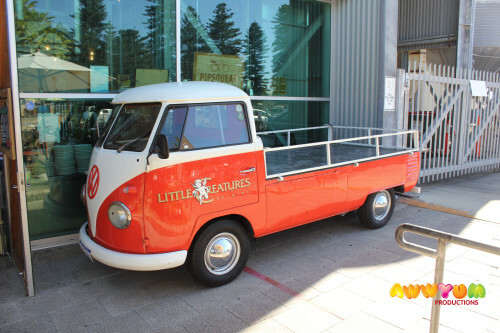 The Little Creatures brewery is an iconic Fremantle landmark. 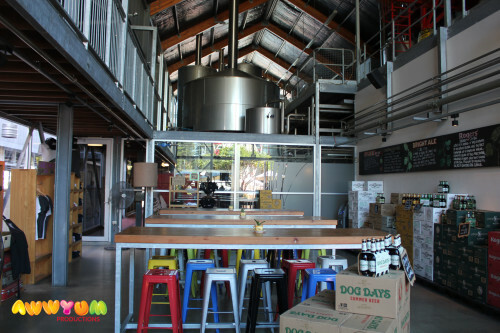 Even over in the Eastern states, Little Creatures is a well known drop – and in Melbourne we have been fortunate enough to have a Little Creatures dining hall (which recently closed), and brewery in Geelong. 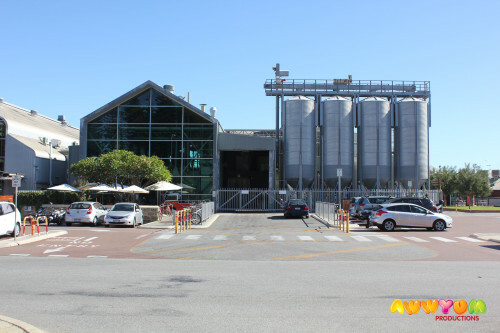 However, Fremantle is where the original brewery is located. 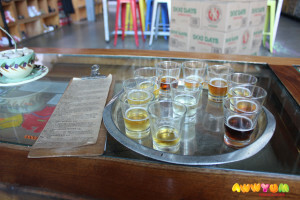 I had the opportunity to visit a number of places during my afternoon at Fremantle, but one place that was definitely on my list was the brewery. 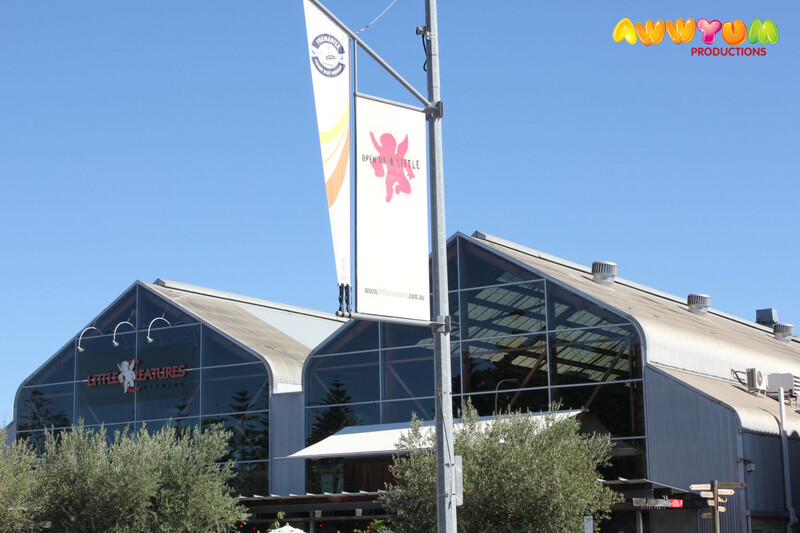 It is located in the Fremantle boat harbour, right on the water and also opposite the Esplanade Gardens. The brewery is easy to locate. 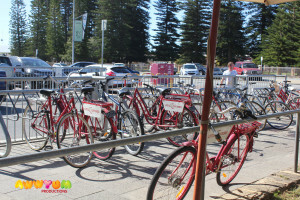 Just look for the combi van or bicycles out the front! Having done so much eating that day, I decided to just drop in to sample their beers, as well as relax and catch my breath for a short while. They have two areas open to the public, one is the tasting room, and the other is more of a restaurant area. 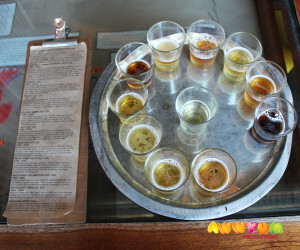 Based on my requirements I went straight into the tasting room. They have all of their beers available there to purchase or drink on site, and some are also available on tap. 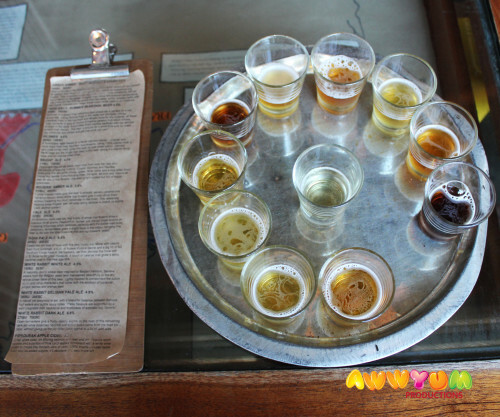 A great way to sample a wide range of beers is to order a sampling platter, which is not obviously on any menu (‘hint – just ask!’). The great thing is that it is free! 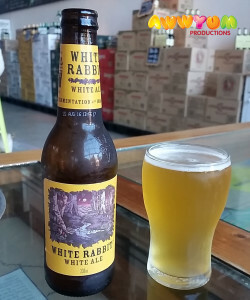 After my tasting plate, I had some more time to kill and decided to order the White Rabbit White Ale, which is similar in taste to a Hoegaarden or blonde beer. Just right for a hot afternoon (the temperature was pushing 40deg). 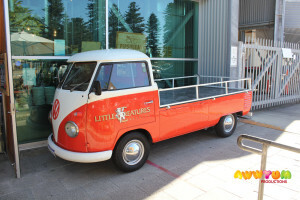 Overall the Little Creatures brewery is still a ‘must visit’ for Fremantle. It is not just for beer aficionados, or rowdy pub style drinking – but rather a nice place by the water that is friendly for families and people looking for a good day out!